…. 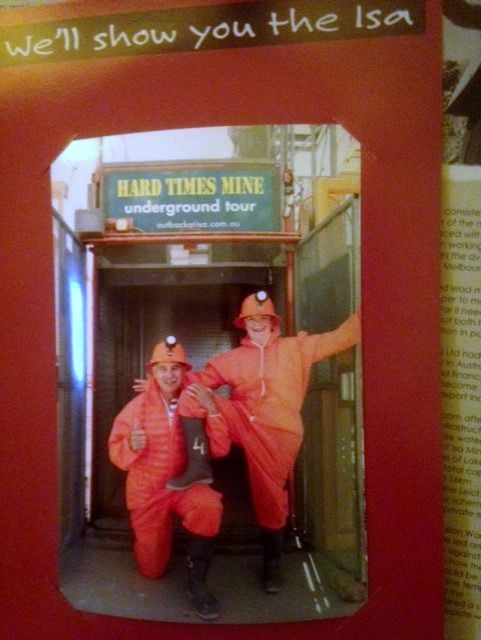 just a couple of ‘hard time miners’…. 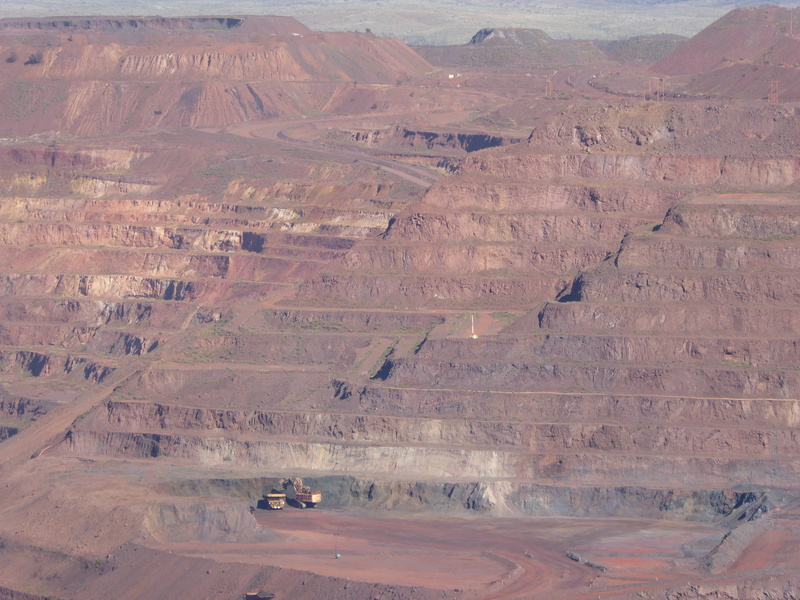 Panorama of MIM massive underground lead, copper & gold mine. leisure, and basically did nothing for 2 days. 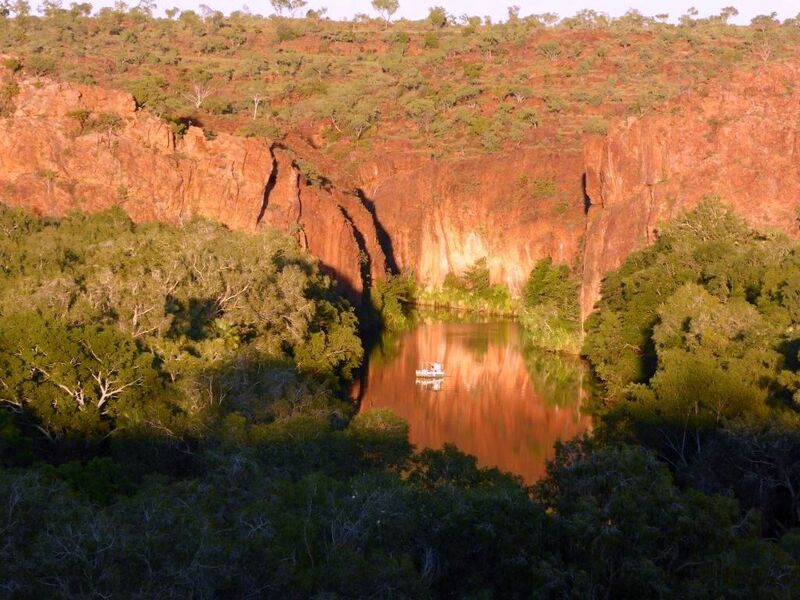 the Pilbara for spleandour and challenge. NP……..had a campfire every one of the 4 nights there. 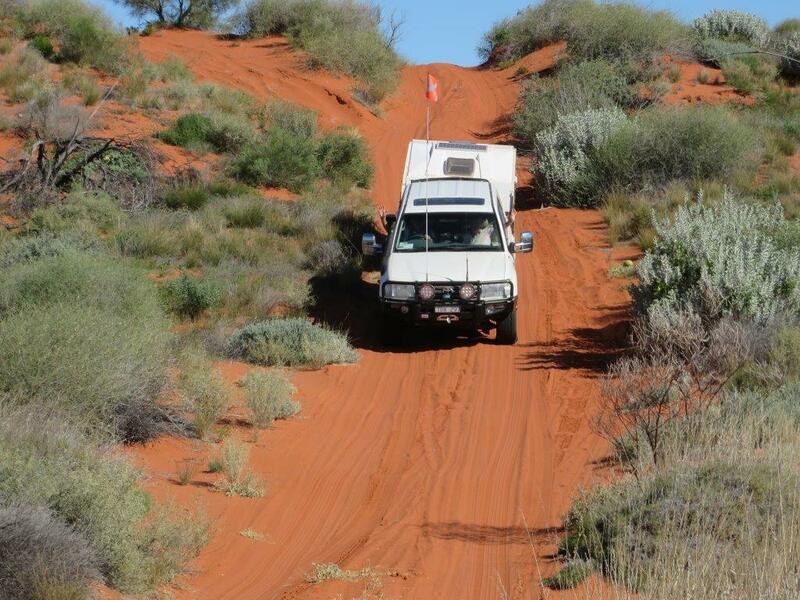 Barry & Denise, our intrepid travelers, are on their way to cross the Simson Desert then heading further North. I’ll be adding to this post when he is able to send updates of their journey……Admin. 15June2016 Had five great days in Mildura catching up with friends from our farming days, then two long drives to make Coober Pedy yesterday. Sadly the weather has thwarted our flights over Lake Eyre and Painted Hills and we are stuck here waiting for friends to catch up for the Simson Desert crossing hopefully starting Sunday. CP hasn’t changed much since we were here 5years ago. where the 1100 sand dune crossings commence. 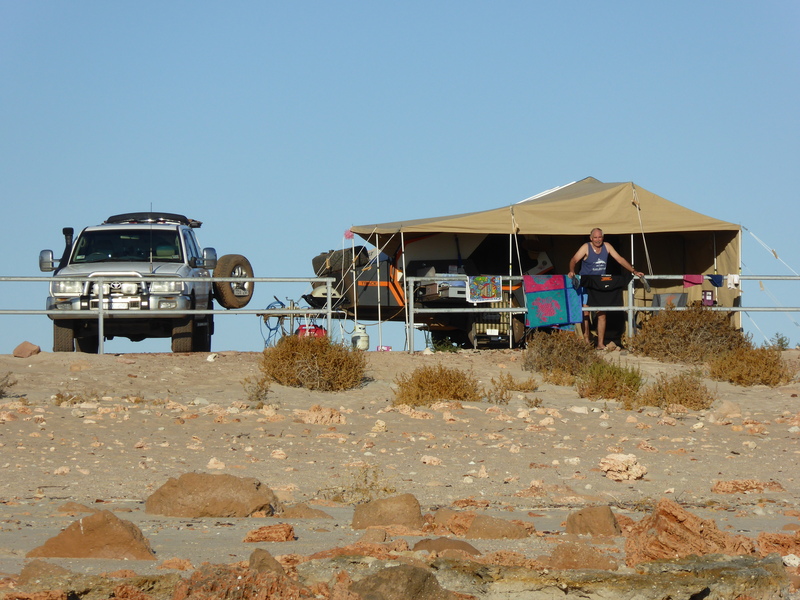 Below – Camp at Dalhousie Springs and an 8.00am swim before leaving. Cresting a dune. You can’t see the track ahead…………. Nearing the crest, trying to maintain momentum with no wheel spin……..
Great camp in the shelter of one of these massive dunes……..
Sunset over a saltlake from the hill…….. Crossing a dry saltlake….and they weren’t all dry! Ripping through mud at the end of another saltlake crossing……..
Another camp with magnificent wildflowers everywhere over the crossing. Part way up, bouncing, swerving, cheering……..
Just before the final successful ascent…..
consumed……..all and more than we hoped for. ** Stay tuned for the next episode in the adventure as Barry & Denise head further north…… Admin. 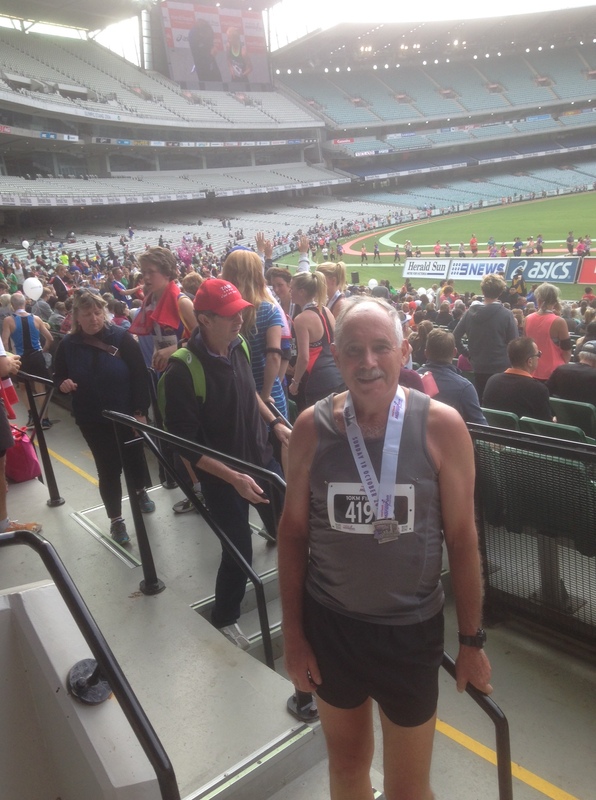 I was home from the 10km run in the Medibank Marathon Festival before lunch, even allowing for a rest in the MCG grandstand watching some of the winning elite athletes in the half and full marathon crossing the finishing line. I was still fantastic spirits, and the caravan was packed, so suggested we head off to Seymour rather than contend with Monday traffic the following morning. We have a favourite CP in Seymour right on the Goulburn River, so it was an easy decision. We had 3 longish days with overnight stops at West Wyalong, Gunnedah, and Tenterfield, then a short drive with a steep descent over the Ranges to Evans Head, about 40 km south of Ballina. The purpose of this trip was to explore the coast between Ballina and Newcastle, an area we hadn’t seen that much of in the past. We also wanted to relax in the comfort of the big van after our previous adventure in T-Rex. We also chose small less well known spots from internet research and reputation. We pre-booked a week on a site of our choosing at Evans Head and weren’t disappointed with our selection. The CP was huge and in 2 distinct sections which we have never seen before. The larger fenced section did not allow animals, and the smaller, less well serviced for those with animals. Like many towns on the NSW north coast, Evans Head was at the mouth of a lovely, protected, tidal estuary, and so had the benefits of a beautiful surf beach as well as the tranquillity of a clean, wide estuary. The lovely little township was a short stroll away, and had everything the locals and tourists could want for, without being overdone. It had great ambience and a relaxed atmosphere. There was also a roughly 6km long shaded walkway along the estuary, over a bridge, and up to a sensational lookout. Along the way was a boat harbour and a fishing co-op with plentiful fresh and cooked seafood to choose from…..and we did. We had a very relaxing week with very warm days, and the only downside being the wind some of the time. Lookout above the estuary entrance at Evans Head, with Surf Clubrooms in view. The CP is behind the trees to the left of the clubrooms. Panorama from the lookout, Evans Head. From the rock wall looking up the estuary at Evans Head. Dog friendly section of the CP in the distance. Reluctantly we moved on to our next stop at Corindi Beach for 4 nights, some 150km further south (or 30km north of Coffs Harbour). Close friends had been here recently, and recommended it. The CP belonged to the “North Coast” chain of CP’s, the same as Evans Head. The chain is NSW Government owned, and all the parks are on Crown Land, so all are in prime positions. This one was on a headland overlooking the ocean in both directions. We again chose our site, with a magnificent ocean view but protected from the prevailing breeze, and one of our favourite activities was sitting watching the humpback whales and calves at play on their return journey to Antarctica….and they were generally only a few hundred metres off-shore and appeared in no hurry as they frolicked around. We also took the chance to do day trips to other near beachside towns for future reference. On a previous trip we explored the magnificent hinterland extensively. It was beach weather….and we were on the beach!! Corindi Beach from near our van. But time passes quickly so another 60 kms south to Urunga and another NCHP for a week, and as it turned out the best of the 5 fantastic stops we were to have. These North Coast HP’s also run a loyalty card, and once you know how to work the system it means one free night a week, which is handy, because they are not cheap. This park was on a lagoon about 1km up the estuary from the ocean. It had it’s own sandy beach, and a dedicated boardwalk out to the ocean. I had picked a site before booking, and it was superb: a big wide grassy site with an uninterrupted view looking straight up the estuary to the mouth and ocean break beyond. 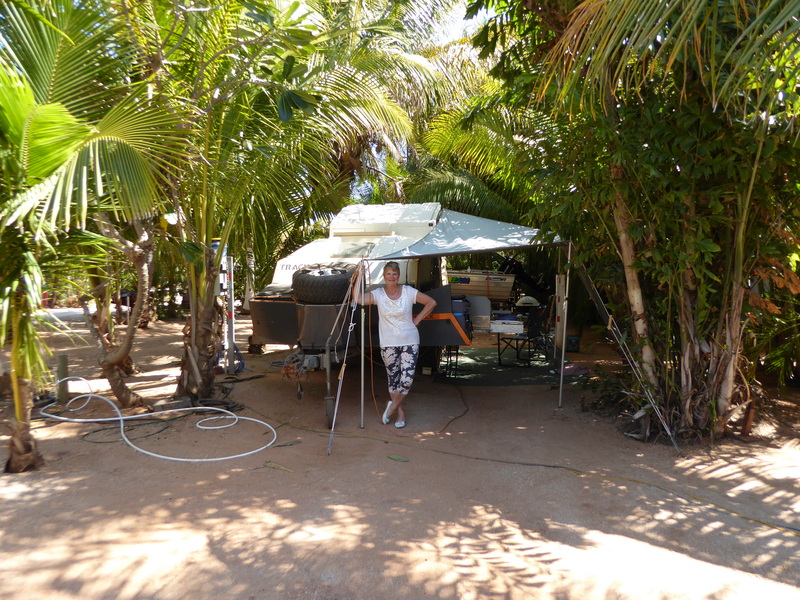 This was adventure in paradise…..well at least relaxation there. It had a small nearby shopping centre just like Evans Head…..and a Bowling Club with the best Asian meal we have had for a long time….authentic cuisine. We did a couple of day trips, as you do, and discovered Nambucca Heads as another possible future destination, even though it was a bigger town. It was hot here most of the time but we did have a “sound and light” show of tropical proportions one night and the following day, as a real thunderstorm hit the coast with badly needed torrential rain. A hot day at Urunga looking up the estuary/ lagoon to the ocean. Our week was over in no time so another 140km south to Bonny Hills (about 25km south of Port Macquarie), and another NCHP. So we were on the flat, then the hill, then the flat, and back to this magnificent, secluded, sheltered headland perched above one of the best surf beaches in Australia, Rainbow Beach. This CP is quite small, but no site is without a panoramic view over the ocean. We chose one tucked in a sheltered corner, and set up for 3 wonderful nights. Bonny Hills is only 10km from North Haven/ Laurieton, which are busy little hamlets on a large estuary leading to a gorgeous and expansive lake. High up behind Laurieton is North Brother Hill/ Lookout, giving a great view over the basin and up past Bonny Hills. It is also the launch point for paragliders…..great to see, but don’t know if I would be game to try. From North Brother Lookout…..Leinster in the foreground, North Haven above…Dunbogan right. Not bad. Run down the slope and……..lift off……..you hope!!!!! Our last stop was Hawks Nest, another 180km south (70km north of Newcastle), and another NCHP of course….to a site (of our choosing) not on the flat or hill, but on the top tier of a medium sized CP. All the same excellent facilities of the other NCHP’s, and a great meal at the Golf Club (in a courtesy bus of course). The weather here was ordinary, and we did have another sound and light thunderstorm on night. We did our normal drive around the area, and discovered a tiny place called Seal Rocks in the Myall Lakes district. This will be a must stay place for the future, but probably in T-Rex, as it is fairly remote and better suited to the camper. One of the beaches at Seal Rocks, on the sheltered side. “Light shower” at Hawks Nest late one afternoon! It was all but over, apart from the uneventful trip through Sydney to Jugoing Showgrounds for a night, and our old favourite Seymour to clean up the van. This trip had none of our rough roads, museums, geology, history, mountaineering etc, but was soooooo relaxing, and proves that we can allow ourselves plenty of time to enjoy doing very little. It also proves we don’t have to venture far to enjoy some of the best locations for CP’s in Australia, or the lovely climate and seaside atmosphere that comes with coastal living on the NSW north coast. Finally 4.30am on Oct 18 arrives, and I am out of bed after a nervous night’s sleep. 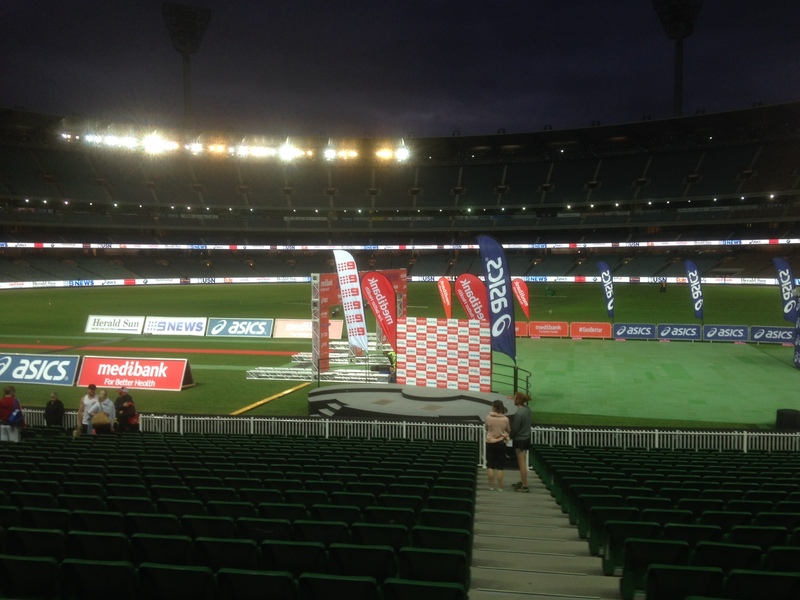 The countdown to the 7.30am start for the 10km run as part of the Medibank Melbourne Marathon Series begins. Get your running gear on, apply Finalgon to calves, hamstrings, and quads, put on “trakkies”, down the litre of high carb drink, enjoy a banana for breakfast, and head off to Glenn’s (my son) in Ivanhoe for a lift to the MCG before public transport begins. When I finally get to the “G” with around 30,000 other competitors in the Series, the atmosphere is electric. I have plenty of time, so walk out through the Stands to see the “G” lit up and empty. This is what all the training is about. The time passes quickly, as I strip off and put my warm clothing into safe storage. I know about the queue at the toilet so get there early to avoid the growing throng of nervous nellies! Again I have plenty of time to go through my extensive pre-race warm up exercises, and I couldn’t have felt better walking down to the start line adjacent to Rod Laver Arena on the banks of the Yarra. A “pep talk” over the loudspeaker from Steve Monoghetti who was also competing in the 10km run was perfect. The gun goes on time and the 7000+ competitors walk, then jog, the run up to the start line…..and we are off. It is a perfect morning for running, cool, still, and overcast. 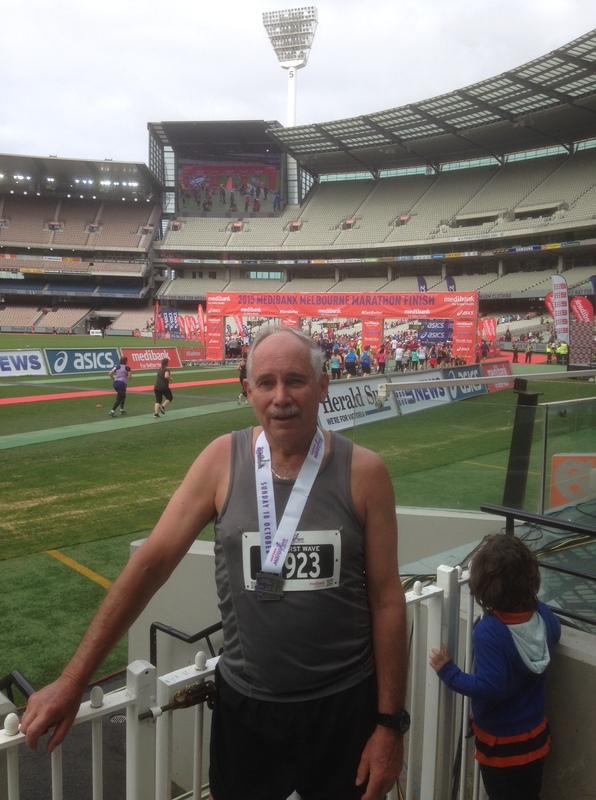 We run up Flinders St, over the Bridge, down around the Arts Centre precinct, then back to the “tan”, up to Linlithgow Ave, back to St. Kilda Rd, over Barrack Bridge, past the “G” tunnel for a hairpin return to the tunnel, then a lap of the “G” to finish. I ran 1:06:04 two years ago, and hoped for around 1:03 this year, but I felt good and ran strongly (for me), so was elated with my official time of 1:00:15, placed 12th of 47 in my age group of 65-69. Overall I finished 2905 of 6126 finishers. I do this as reward for hard training and meaningful endeavour, testing myself to ensure better physical and mental health for the wonderful years ahead. Bring on the Triathlon, Open Water Swimming, and Road Cycling Seasons. We left Broome somewhat reluctantly, as our setting, the weather, our new-found love of the place, and our state of relaxation/ contentment were begging us to stay……but our “adventure juices” won over with an exciting plan for our return home. 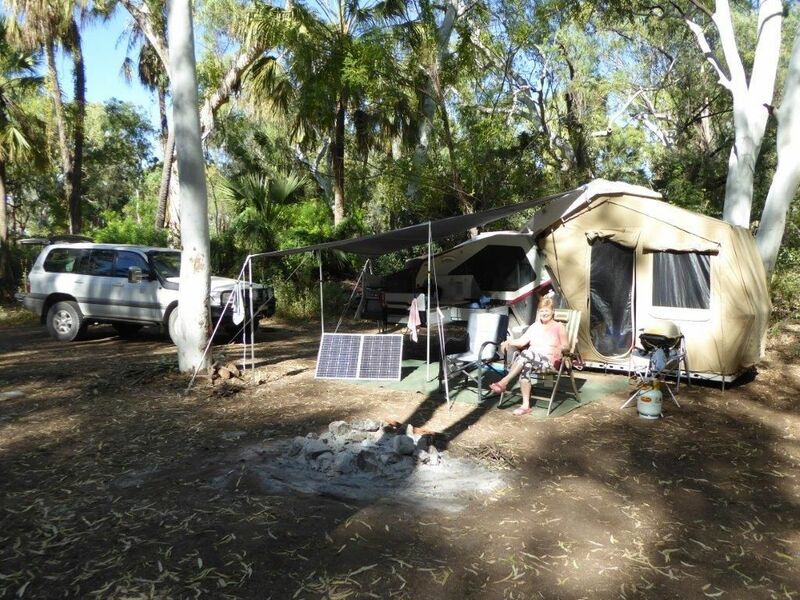 We travelled east to Fitzroy Crossing retracing steps from a 2011 trip, but drawn by another one of our “soul” places, so we were delighted to pull in to The Lodge CP again, right on the banks of the Fitzroy River. There are plenty of saltwater crocs here, but we were told they stick to the river, and the banks are quite high. We set up in the non-pwr area, and went for a bit of a drive ending back at the small shopping centre. “Break and Enter” is frowned upon, and the security is solid, but nothing compared to that encasing the local fuel pumps! 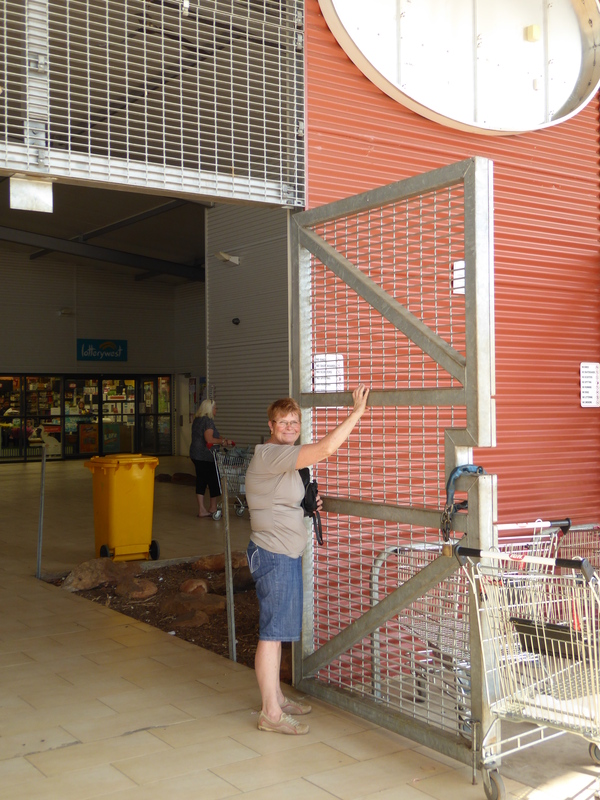 Security at Fitzroy Crossing shopping area!!!!!!!!!!!!!! 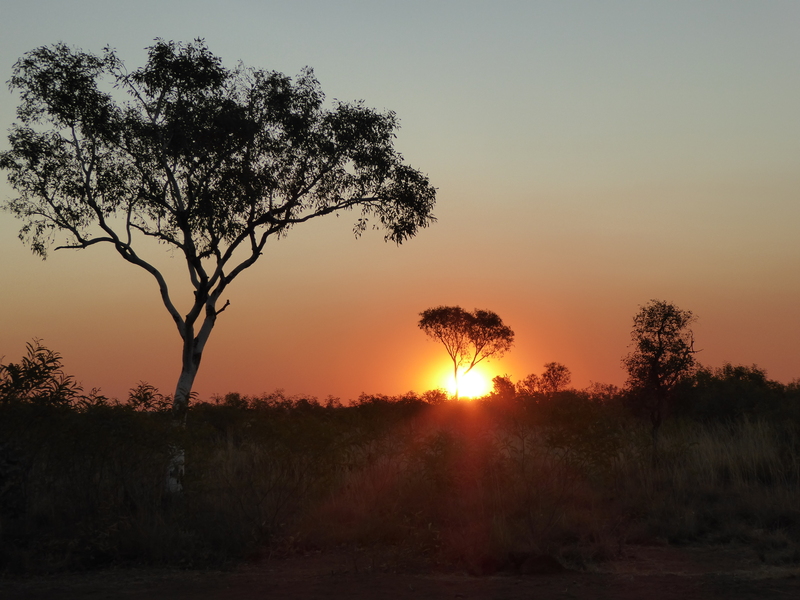 The following morning we were away bright and early as we didn’t really want to stay at Halls Creek again, but hoped to start our 900km Tanami Desert Track adventure by reaching Wolfe Creek Crater some 125km down the track. 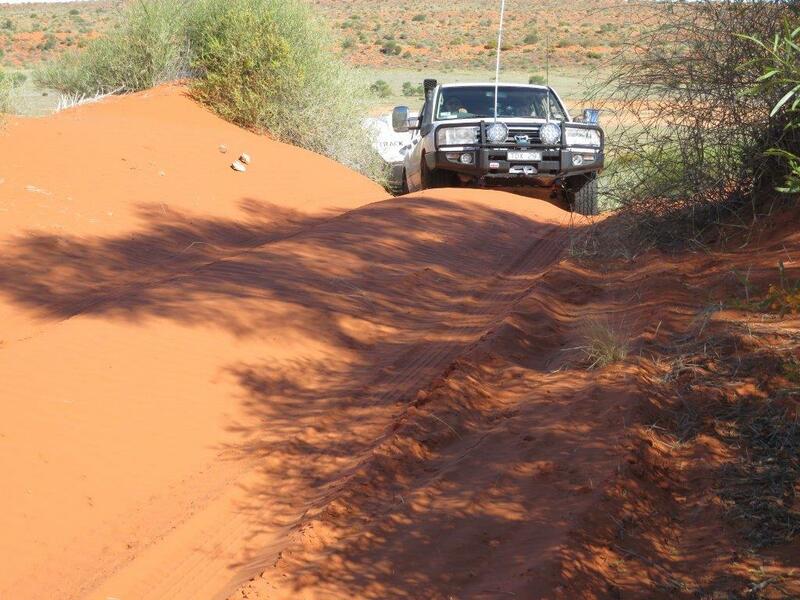 We expected the Tanami to be rough, so let the tyres way down before tackling it. It didn’t let us down, being heavily corrugated to the Crater turnoff…..then it got really bad, taking an hour to travel the last 23km. 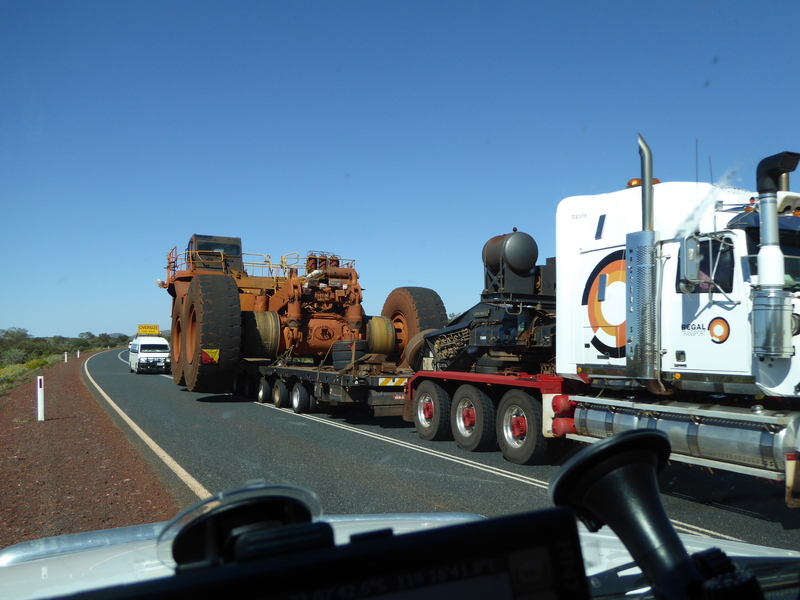 Let the tyre pressures right down for one of the roughest…………as any good “truckie” would do. 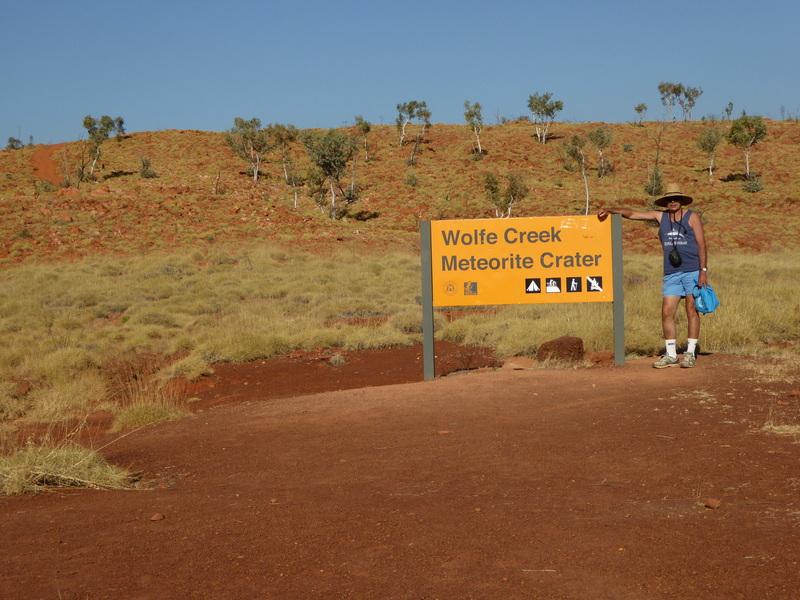 Corrugation road for 23km to Wolfe Creek Crater……a one hour journey!!!! It was all worth it, as the free-camp was fantastic, and the Crater awe-inspiring. 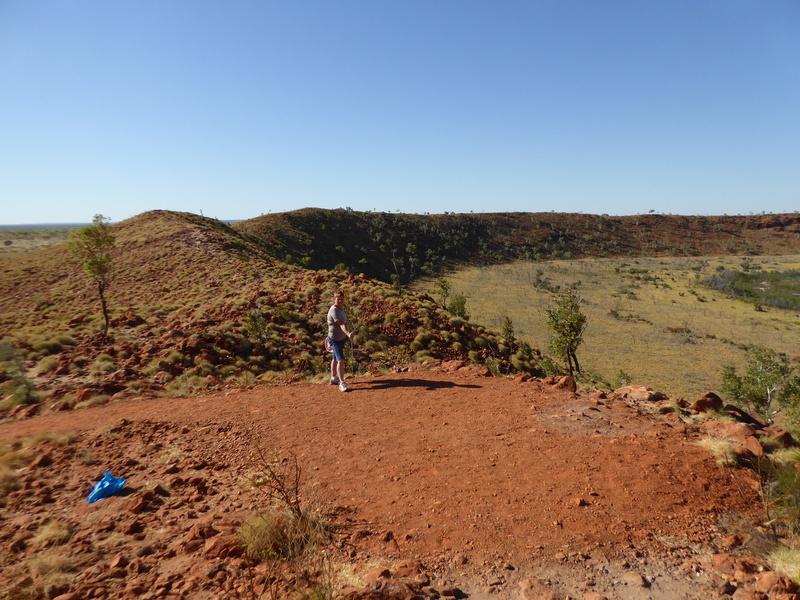 Thanks to Nick-OMNI-Gange for researching and posting our whereabouts….it happened 300,000 years ago when a 50,000 tone meteorite crashed to earth here causing a 880m circular crater to be formed. It is well preserved as the very harsh and dry climate here has prevented overgrowth. It is the second largest such strike known to earth behind one in Texas. Fantastic freedom camp with the crater rim in the background….as the sun departs. Early in the sunset as I have to control the bbq, and maintain hydration. We continued on the long and not so winding road, which improved after we crossed the border in to N.T. 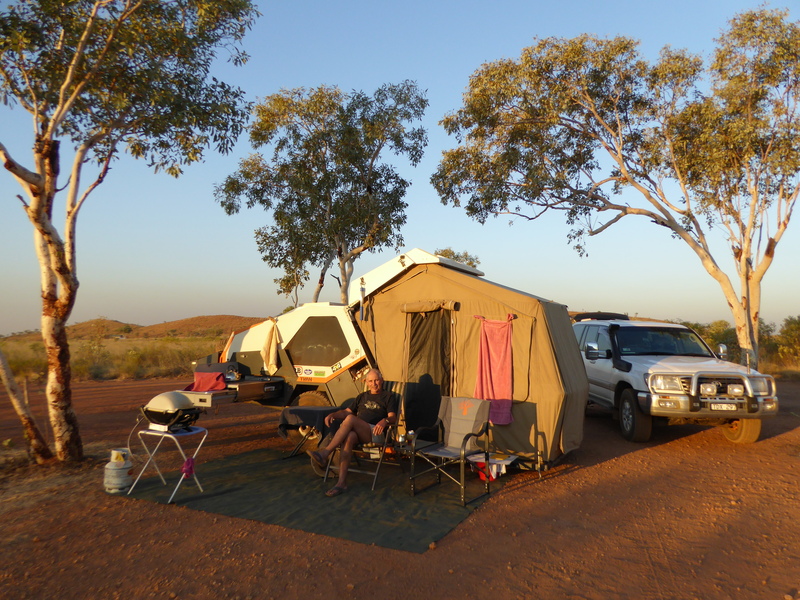 The scenery didn’t change much over the length of the drive…..as I suppose you may expect in an arid desert, but we finally pulled off to an empty designated free camp. We just started setting up when 2 carloads of aboriginals pulled in. We hadn’t realised that a “community” was about 10km down the road (and 5km inland as they always are). They are loud and unkempt (by our standards) and their toilet habits crude (by our standards) but I didn’t feel threatened. Denise was elated when another traveller pulled in, and they set up right next to us. The aboriginals finally left, and we shared a drink with new friends Tony and Dianne from Canberra. 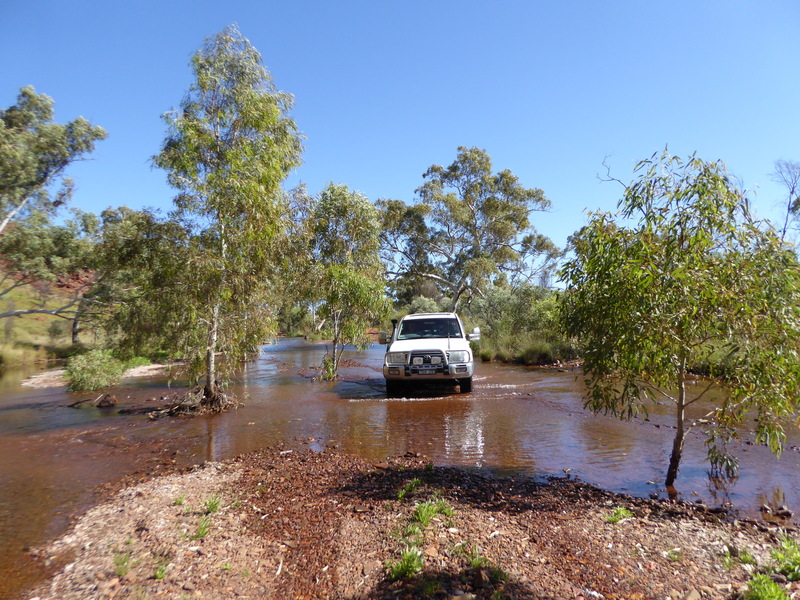 We knew we would complete the Tanami Track the next day, but needed a “splash” to make it safely to Alice Springs, so pulled off the track and wound our way in to Yuendumu aboriginal settlement. I will choose my words and sentiment as carefully as I can, and my observations to Denni on the way in to the fuel stop went something like this…….”lots and lots of dogs here…..dead dog on your side of the road……can’t see many windows left in the houses…..pity about all the trash in the yards and streets……fair size community – must be several hundred homes – all trashed (by our standards)…..looks like a fair sized school over there – nice buildings and grounds……hey, where are the residents, have only seen a few stragglers!”. 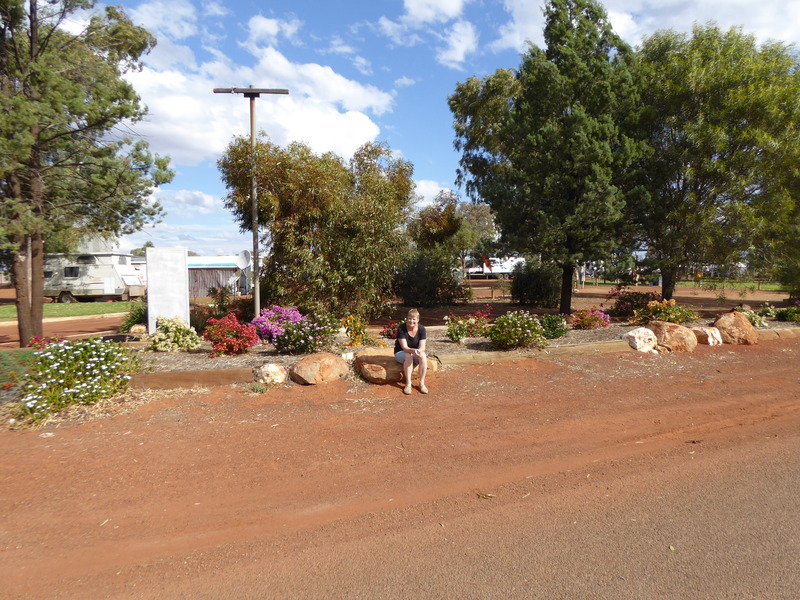 We finally found the very small store/ fuel stop and a few aboriginals. Denni wouldn’t get out of the car, but when I spoke to one of the locals – she was quiet, no emotion, and sort of polite, but I could see nothing in her eyes; like emptiness of life or purpose. The white owner soon appeared at the diesel pump on a lean with broken glass face and explained only he could coax it to go!! After putting in the 15l I had requested, @ $2.73/l, he climbed on his soap box and let it out (politely). This was a “dry” semi functional aboriginal community with the main (sporadic) employment the aboriginal art centre. The school had about 200 enrolments, but attendance was another issue. It catered for primary and secondary students delivering a heavily modified and generic syllabus, skewed to aboriginal culture and history, but with English a key subject. BUT, that big new building you passed on the way in is our brand new $7.6 million POLICE STATION THAT WE DIDN’T ASK FOR, DON’T NEED, AND DON’T WANT, because despite outward appearances there is little to no crime here!!! 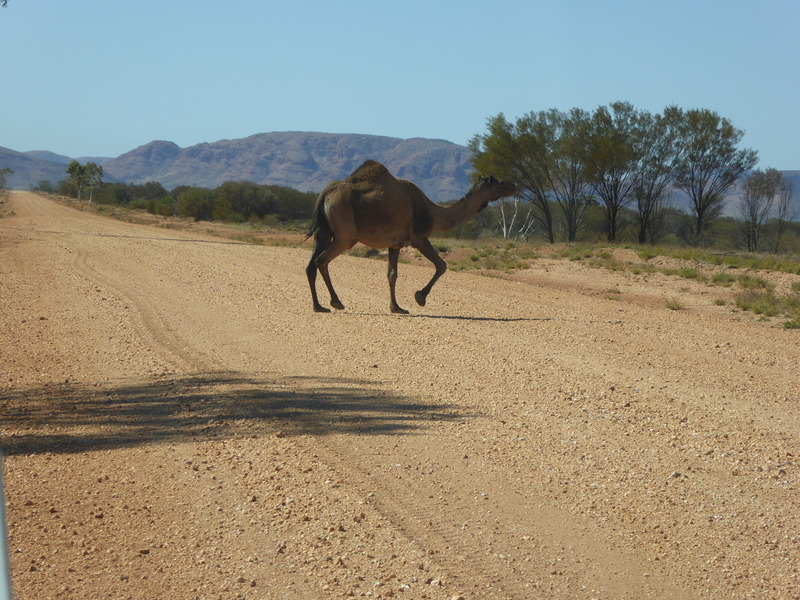 I thanked him for the fuel and sermon and jumped back in the car and crept out of town, back to the Tanami Track. 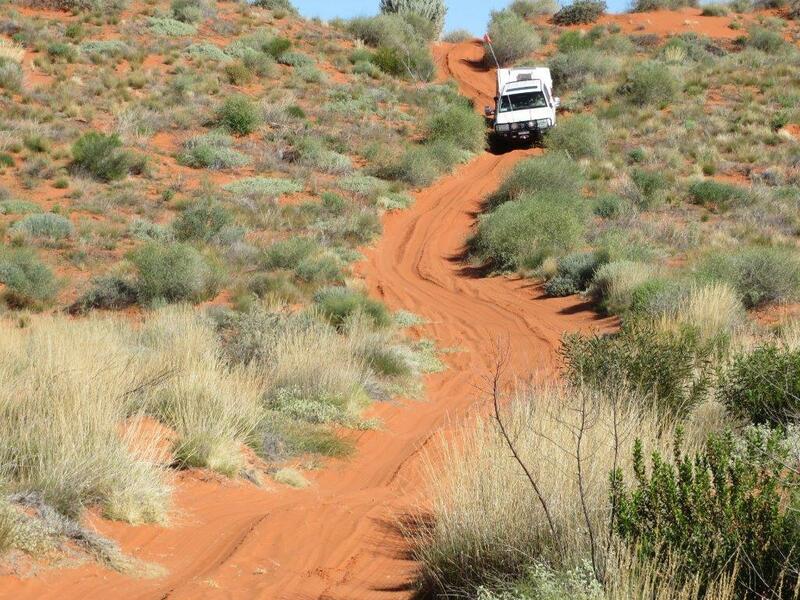 There are in fact MANY such communities right across central Australia out of sight and mind, and although I have no immediate solution to the issue, I can’t help thinking this just isn’t working. 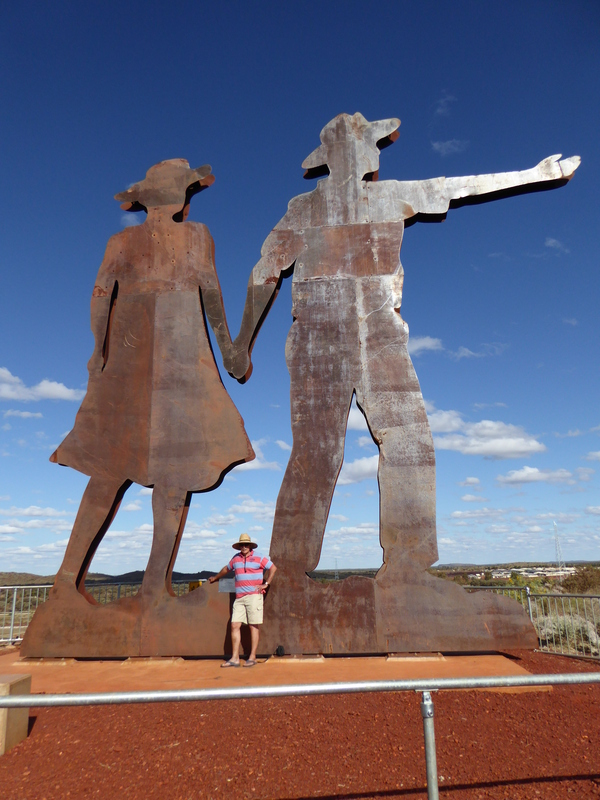 We had about 300km to Alice, so stopped at Tilmouth Roadhouse for lunch and a look at a well renowned art gallery, plus a good place to re-inflate the tyres for the bitumen road ahead. 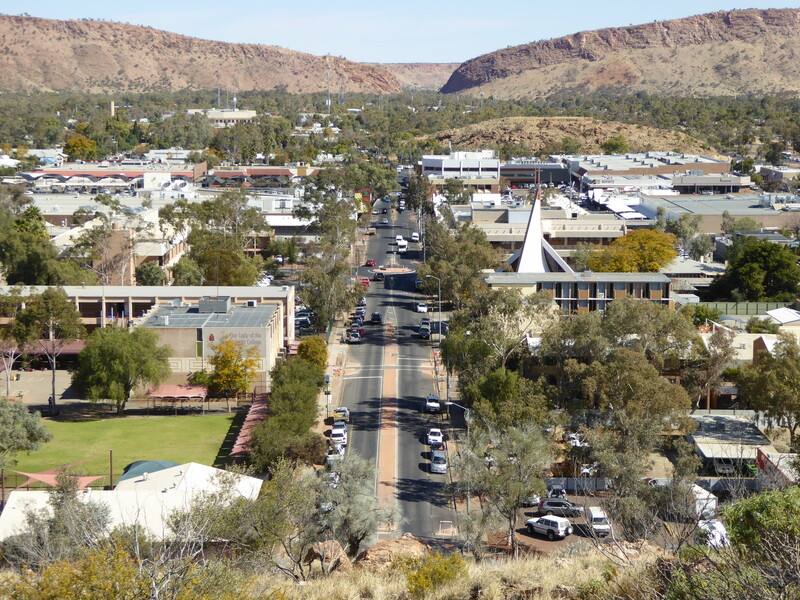 We had spent time in Alice and out in east and west Macdonnell Ranges in 2011, so this time it was r&r, washing, shopping, and another look around a town we really like. It has all the amenities of larger cities, but still retains a country feel. Refreshed and refuelled after 4 days, we were ready to return to the dirt, and head 68km north of Alice, then east on the Plenty Hwy (another part of the Great Central Road) to Boulia. The Great Central Highway eventually finishes at Winton. 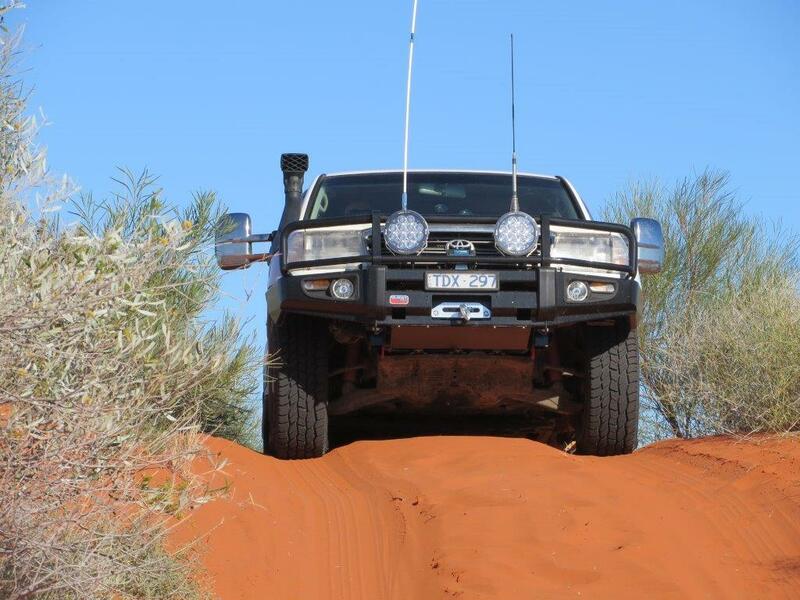 The road was pretty good with some sections of light corrugations…..but lots of bulldust. 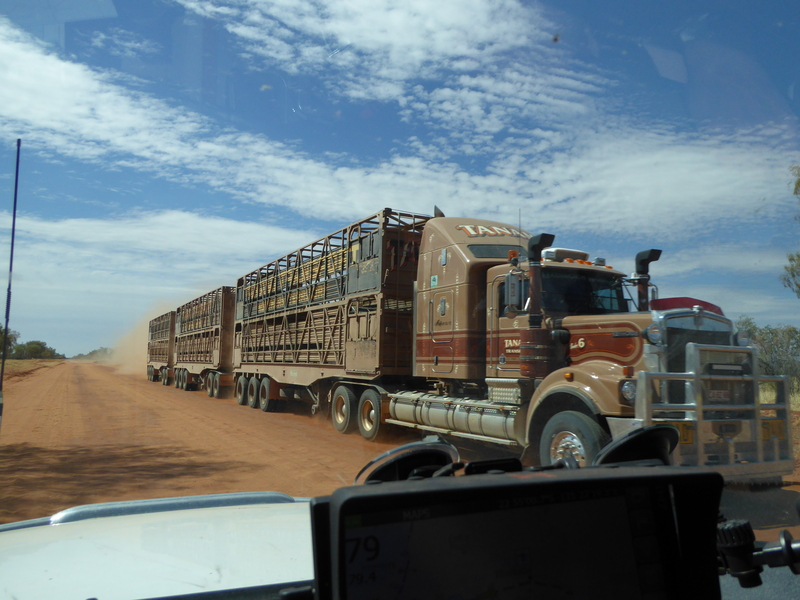 There were plenty of road trains moving cattle out of drought ravaged central Australia, and lots of open road. 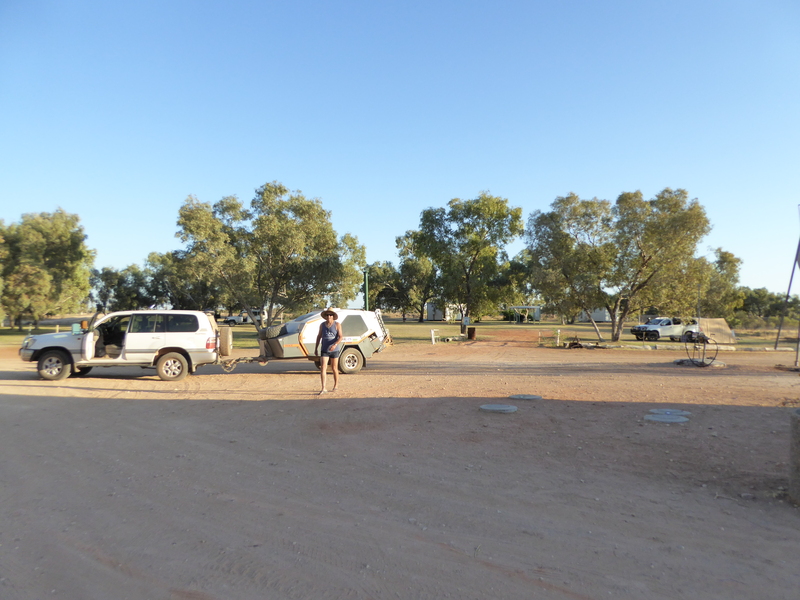 We made good time as we were fresh and the road good, so we made it to Tobermorey, a cattle station on the NT – Qld border. It was like an oasis in the desert of bulldust. This bulldust is like talcum powder, and is hazardous on the road as you can’t see how deep or wide it is, and once in it, steering becomes unpredictable with loss of traction. If you don’t maintain momentum, it is also possible to become bogged, so just keep your concentration up, and drive to the conditions…..common sense is the winner. 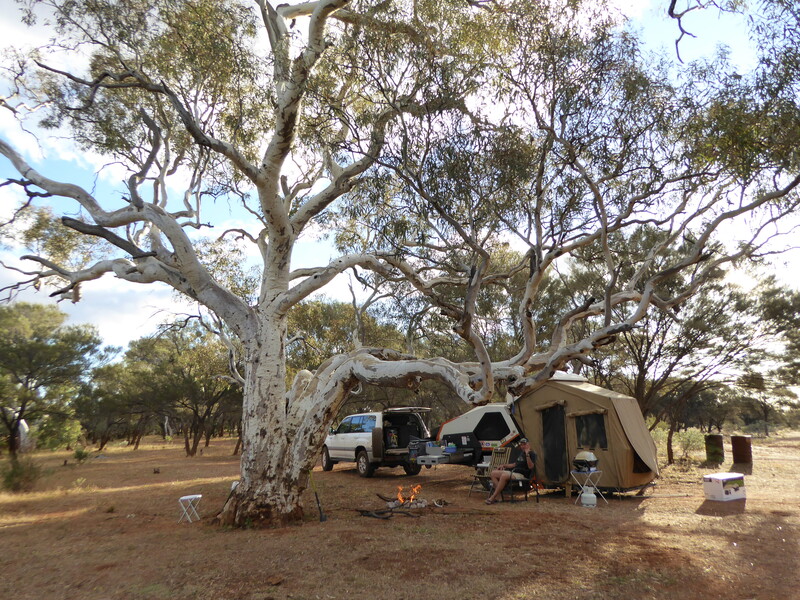 Back to Tobermorey, there was a beautiful big shaded and grassed area to camp on, and lovely hot showers, even if it was all courtesy of the Great Artesian Basin! We take power for granted, but on this station the nearby generator goes 24 hrs a day…..a clean body, full tummy, and adequate “hydration” ensured we didn’t hear a thing until the morning!! 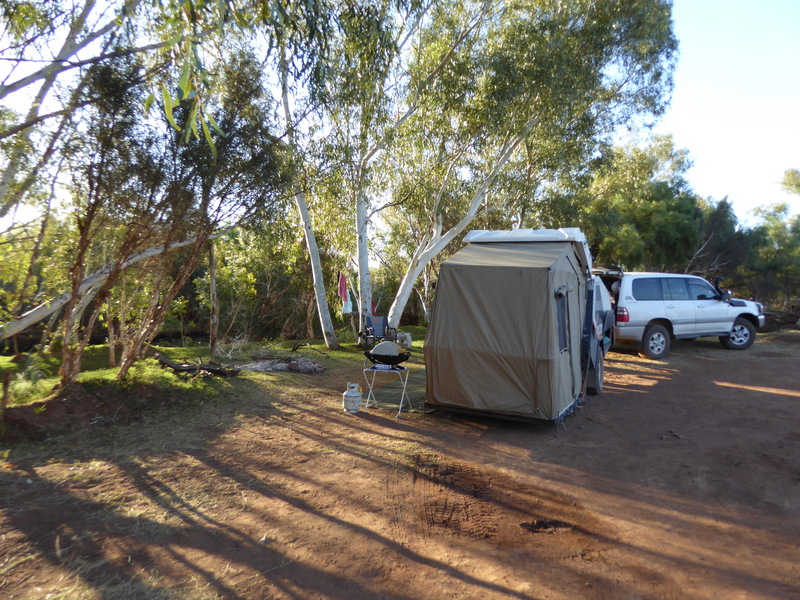 We only had 250km to Boulia the next morning, and soon set up at the CP right on the banks of the Burke River. 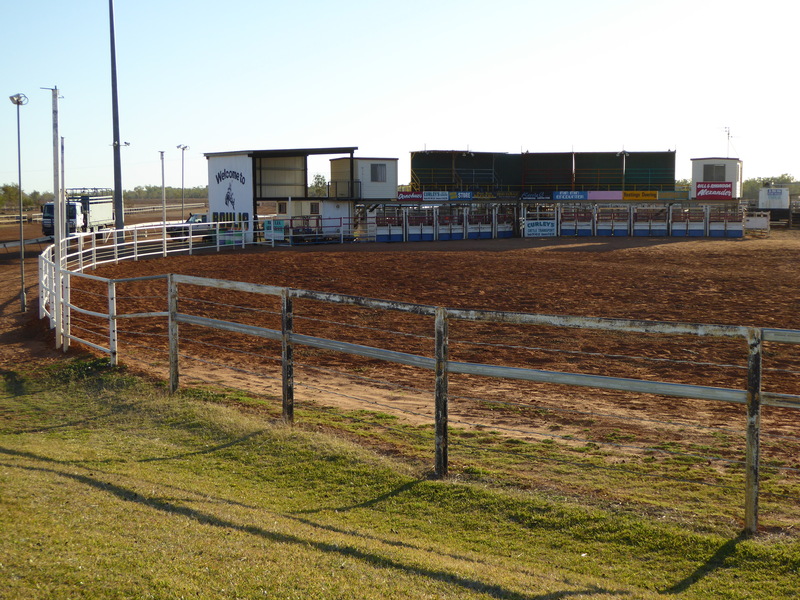 Boulia is 300km south of Mt. Isa at the junction of the Diamantina and Kennedy Development Roads. The town’s fame largely rests with its association with the Min Min Light, a strange spectral light that can appear, hover, disappear and reappear with an eerie will of its own. The life like recreation of sightings at the “I” was sensational, and poses more questions than answers as you would expect. 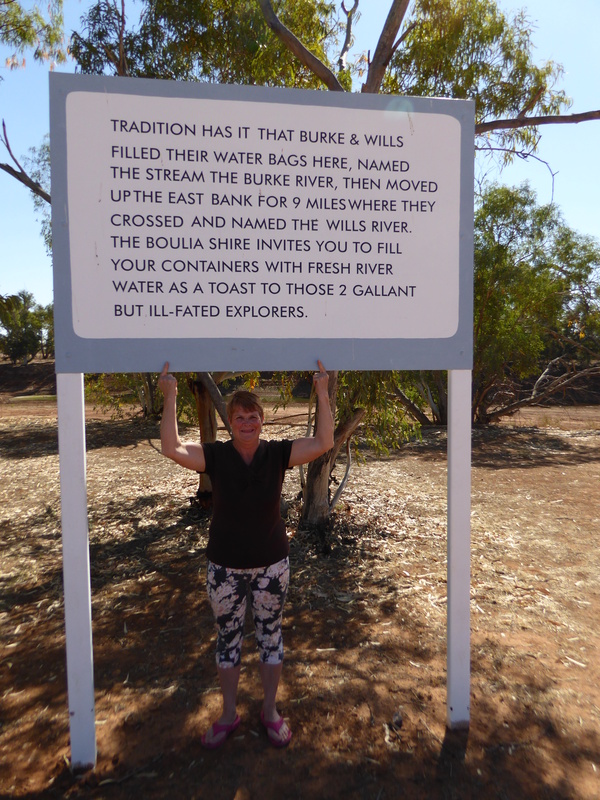 There was plenty of Burke & Wills landmarks with the waterhole and slashed tree nearby. 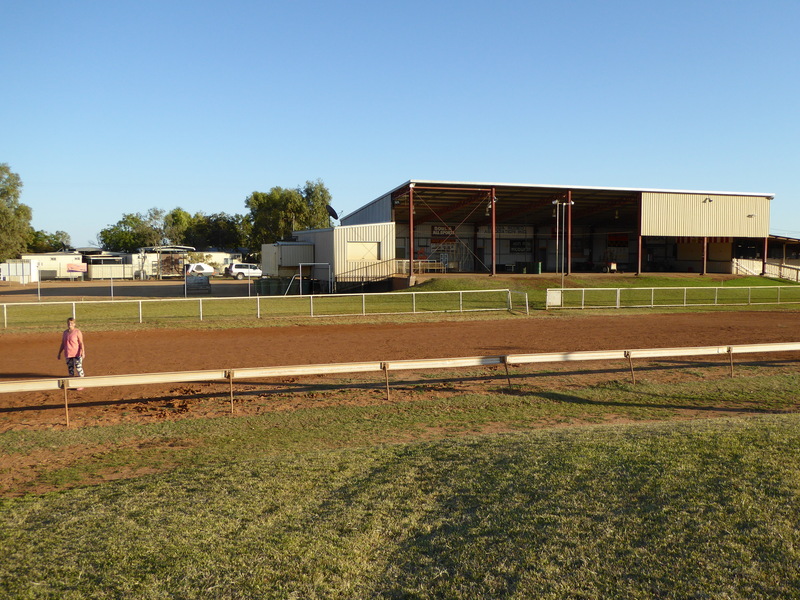 Boulia Race Track with the main grandstand featured. 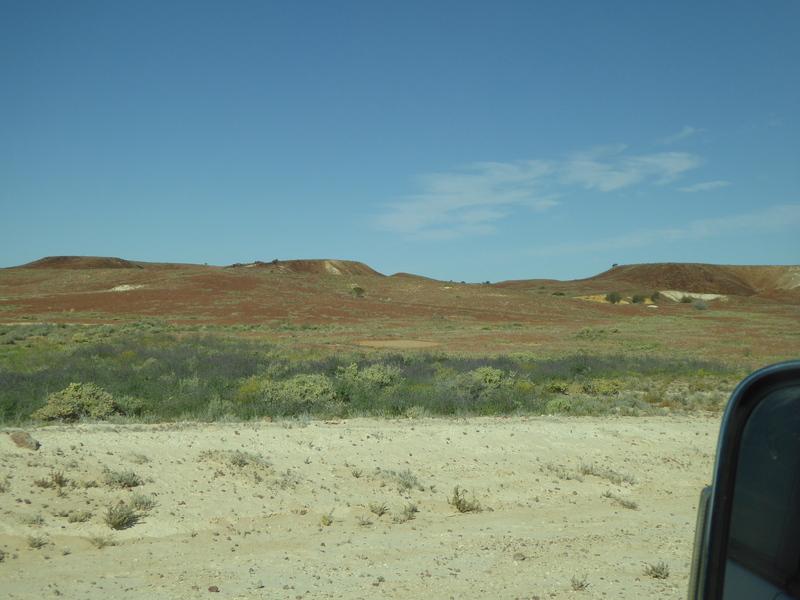 But we moved on with Bedourie and Birdsville in our sights. The road was mainly sealed but narrow, so we were in Bedourie before lunch. It was a foul day with strong, hot, and gusty northerly winds. 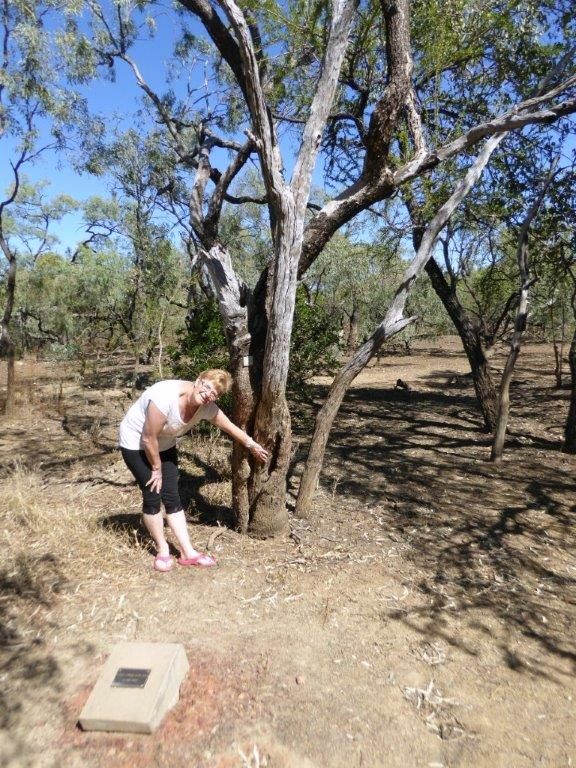 The two highlights on the road were the Vaughan Johnson lookout, and a substantial stand of Waddi trees. The Vaughan Johnson lookout was only recently completed at a shared cost of $470k, but is a magnificent highlight with 360 views to match, and is a welcome change to the vast emptiness of the gibber and Mitchell grass plains. It has a number of well- presented interpretive panels detailing the pioneering history of the area with emphasis on the evolution and importance of early transport in the far west of Queensland to today’s road trains. 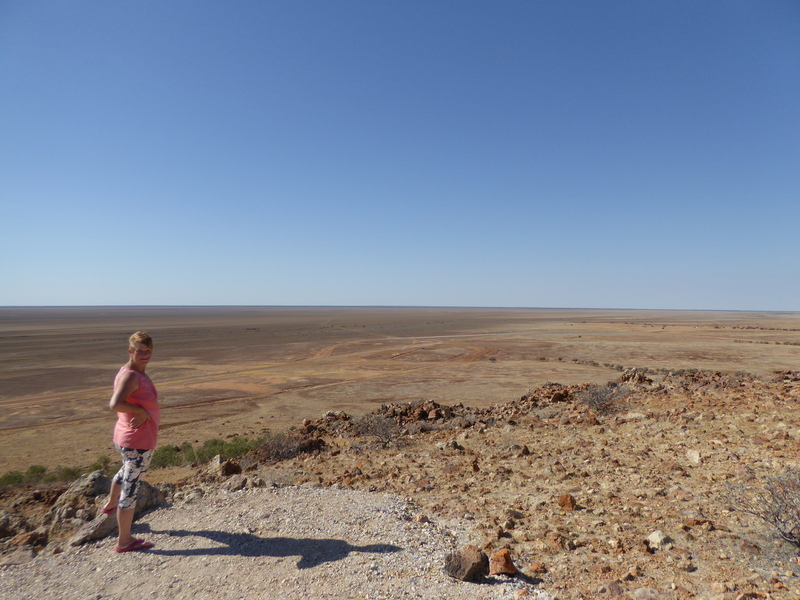 Vaughan Johnson lookout, with the vast gibber and Mitchell grass plains beyond…..but in drought. Bedourie (meaning “dust storm”) is a small town of 120 people, but is the administrative centre of the huge 95,000 sq. 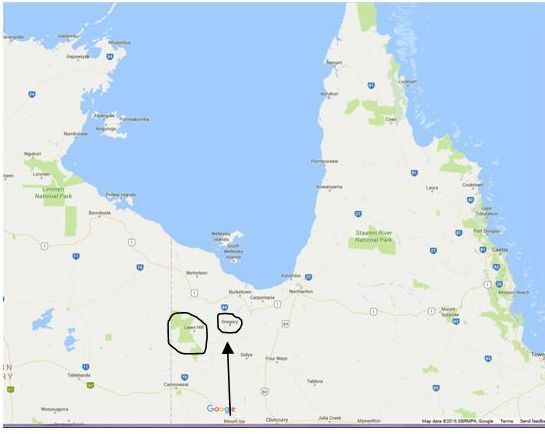 km Diamantina Shire. It has limited services, but a camp ground, a racecourse (naturally), an old pub and a 25m/ 6lane swimming pool with 42degC artesian spa!!!!!! It seemed out of place, but who cares – we loved the hot and cold pools on a day in the mid-30’s with strong winds to maintain the namesake. Unfortunately the pub’s reputation was shattered by a shocker of a meal after a pleasant sit at the bar chinwagging. 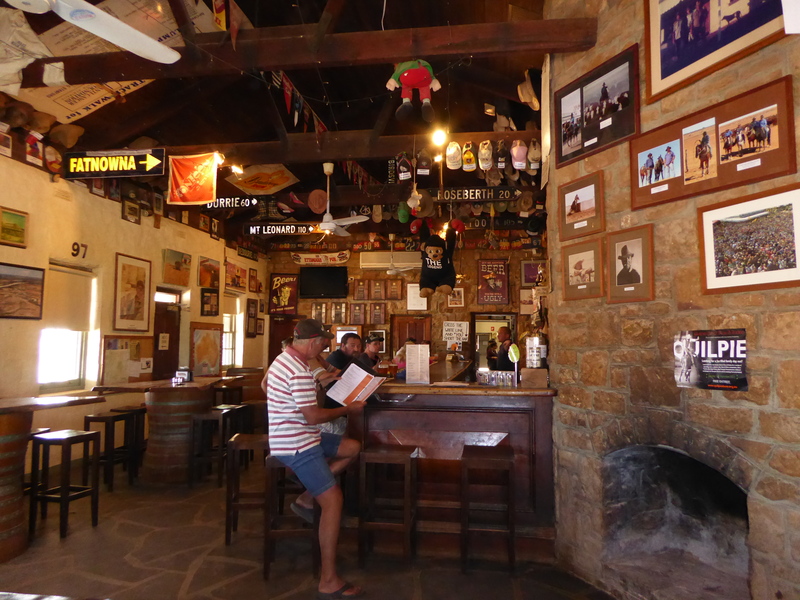 Inside Bedourie Pub with Denni holding court……pity the meal didn’t match the ambience!!! The weather forecast from Bedourie wasn’t encouraging for our plans to do Haddon Cnr, Cordillo downs, Innaminka, Dig Tree, Tibboburra, broken Hill….home, but we had come this far so set off for Birdsville with the fall-back plan to come home via Birdsville Track rather than Strezlecki Track. 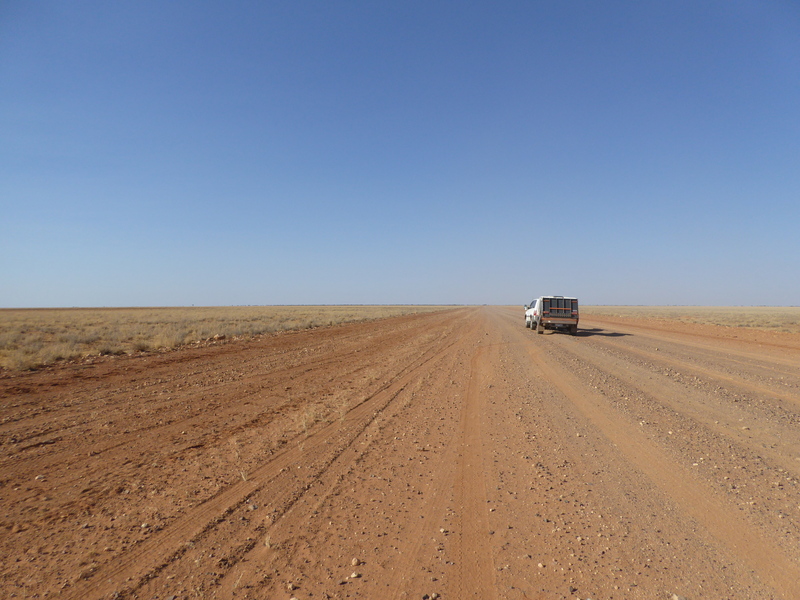 Bedourie to Birdsville was mainly dirt, very bulldusty, and some corrugations which we have come to expect and handle. 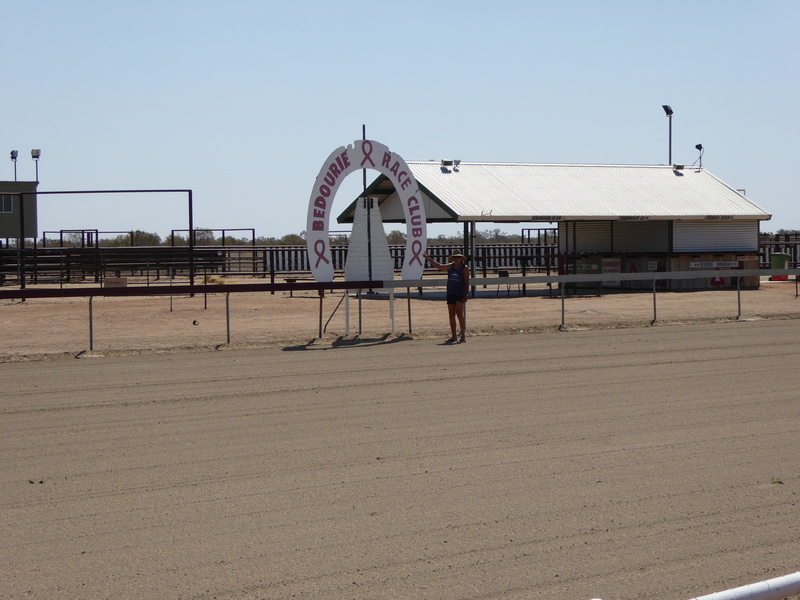 We came in to Birdsville to see a sign announcing population 150 + or – 7000! (for the race weekend). 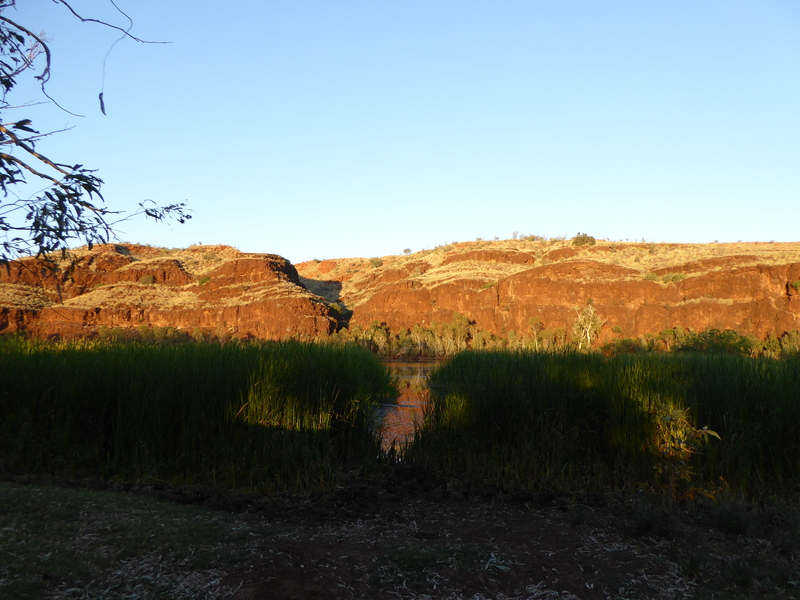 The 7000 were commencing the pilgrimage, but we still found a lovely spot on the banks of the Diamantina….with the obligatory surface layer of bulldust everywhere. 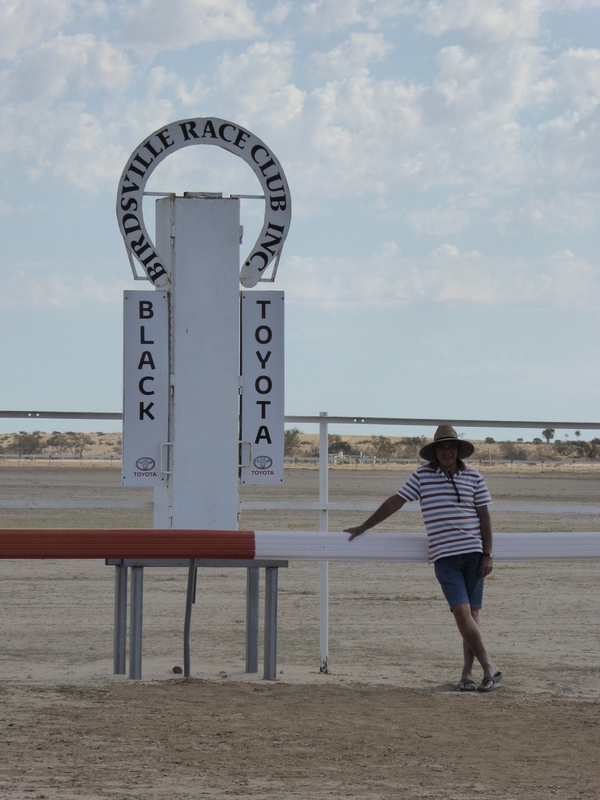 Birdsville has one CP, 2 pubs (the old one completely derelict), a bakery, an airport with agistment for unlimited light aircraft flying in for the race weekend, and a roadhouse for fuel and very basic supplies…..and a racetrack of course! And enough primitive free camping to support the annual influx of pilgrims. 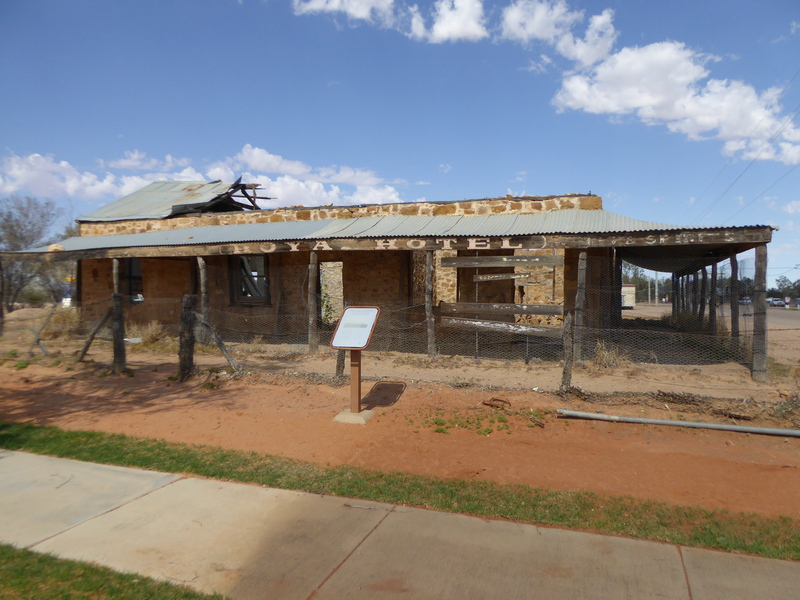 It also has reminders of the ill- fated Burke & Wills expedition identifying a waterhole camp on the Diamantina, and a “slashed tree” marking a point to return to. The weather was against our initial plans, so we couldn’t return on the Strezlecki. 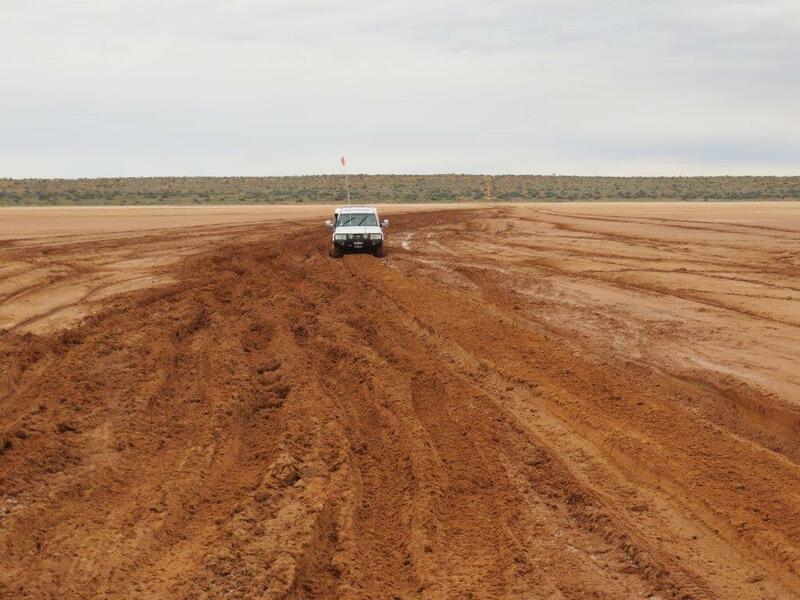 So it was down the famous Birdsville Track. It was smooth at first, but soon turned to the characteristic tyre destroying gibber rock road, so it was tyre pressure and speed down to reduce the risk of puncture and breakdown. 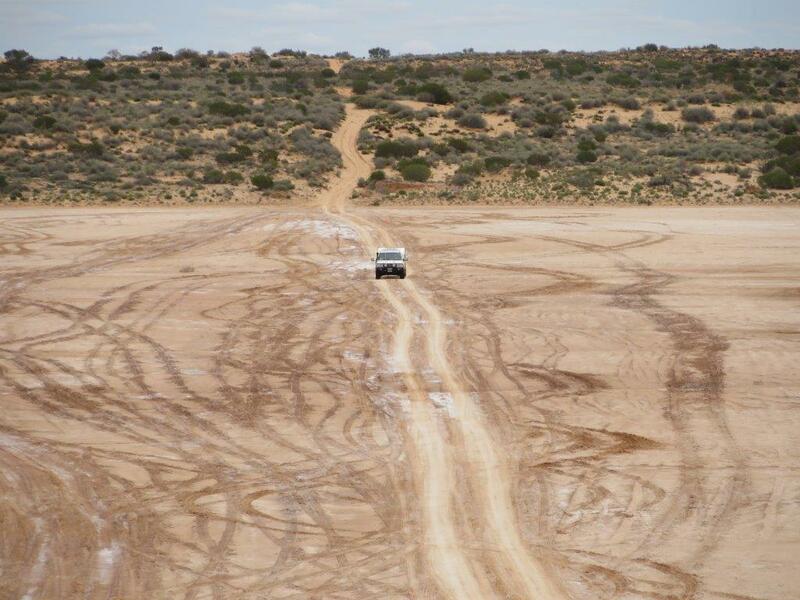 The Track borders the Simpson Desert so the massive parallel sand dunes flanked us most of the way. 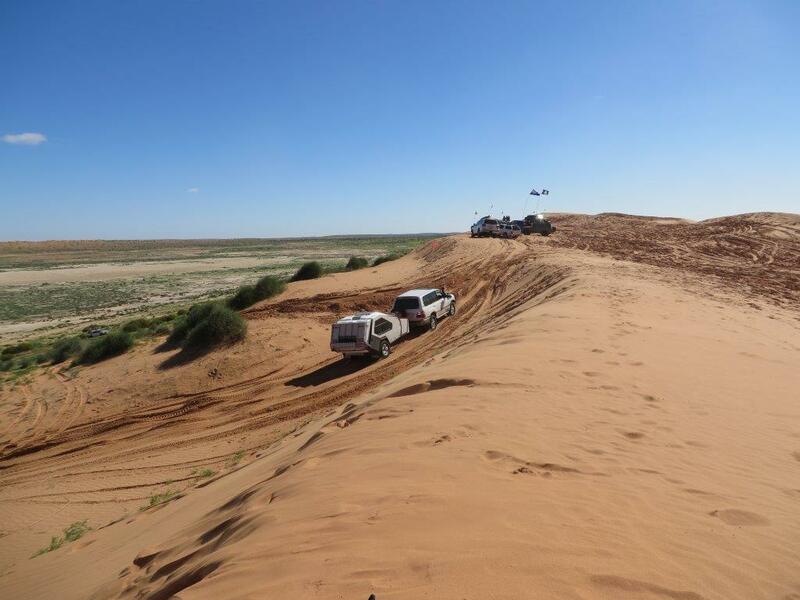 Someday soon we hope to cross the Simpson Desert dune challenge, but for now the enormity and steepness of this endless dune system just haunted and beckoned us. 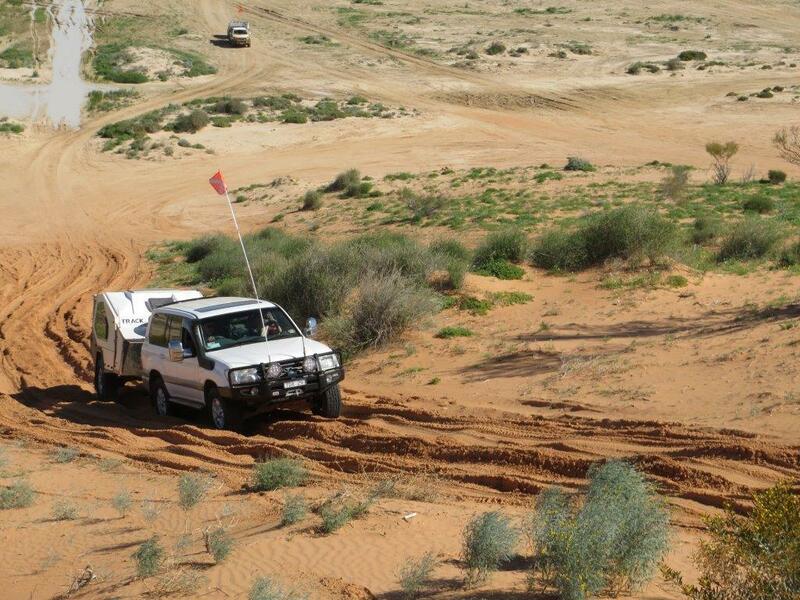 A glimpse of the parallel sand dunes that are the real test when crossing them from Birdsville to Dalhousie Springs……one day…..soon for us. We made it to Mungaranie Hotel and Campground the first night and had a hoot of a time. 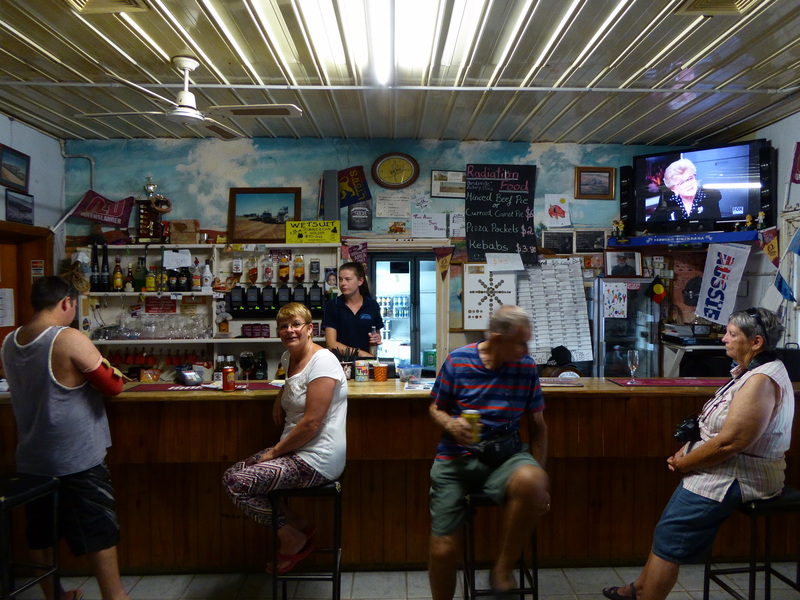 The bar was packed with station hands and tourists (most on their way to the Birdsville Races), the atmosphere and meal sensational, and we just made it back to the van, when a jam session commenced and went well into the night. 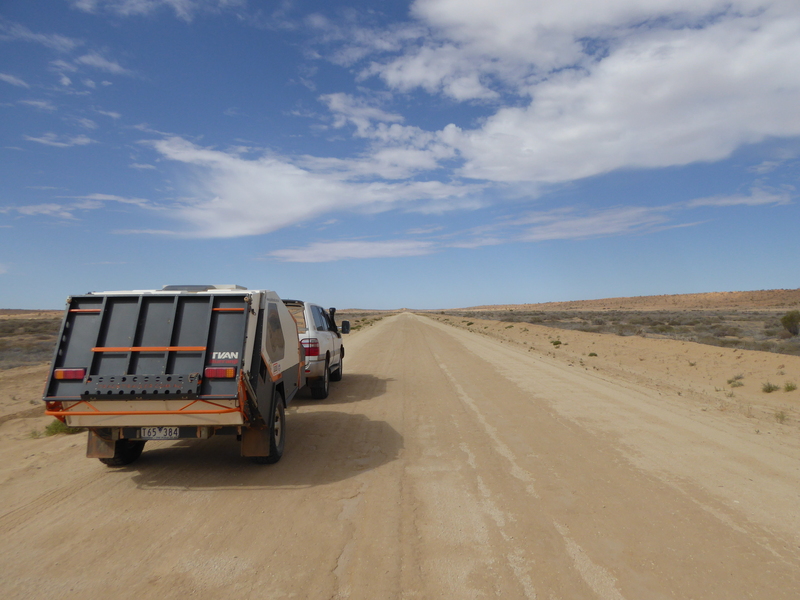 We came off the Track at Maree, where we had commenced the Oodnadatta Track many weeks before, then down past the Flinders Ranges again, finishing up in Mildura for 4 nights to catch up with friends from our previous farming life. It was really cold again so we had no hesitation retreating to our home in Diamond Creek to catch up with family, friends and my fellow OMNI mates. Safe travel everyone, and always be thankful that we live in the greatest country in the world. 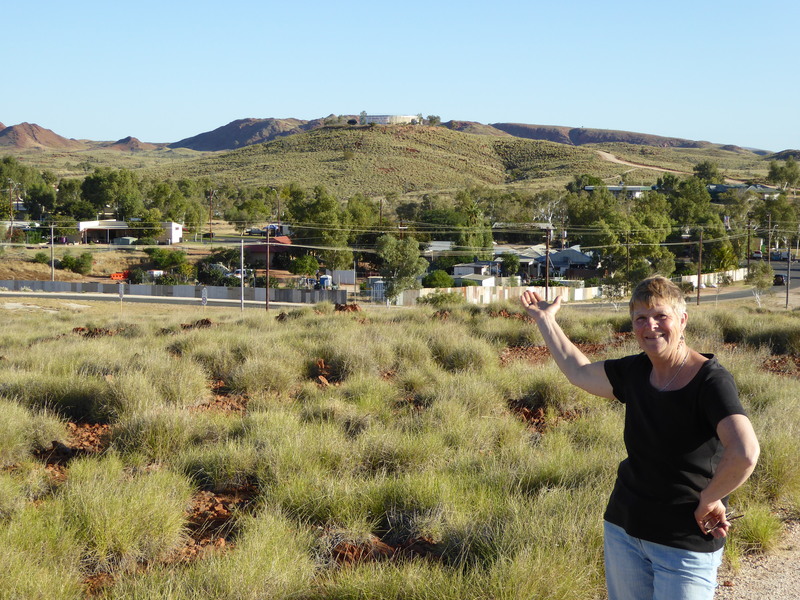 Before leaving Yulara, I feel I should comment on the divided opinion surrounding Uluru – Ayres Rock. It is a WORLD FAMIOUS ICON, visited by large numbers of Aussies and tourists from all over the world. For tourists it is almost a rite of passage to climb the “Rock” if physically capable, because believe me, it is a very strenuous climb…..as we did it some 20 years ago, before it was frowned on. On this trip, we did the 12km walk around the base of Uluru. 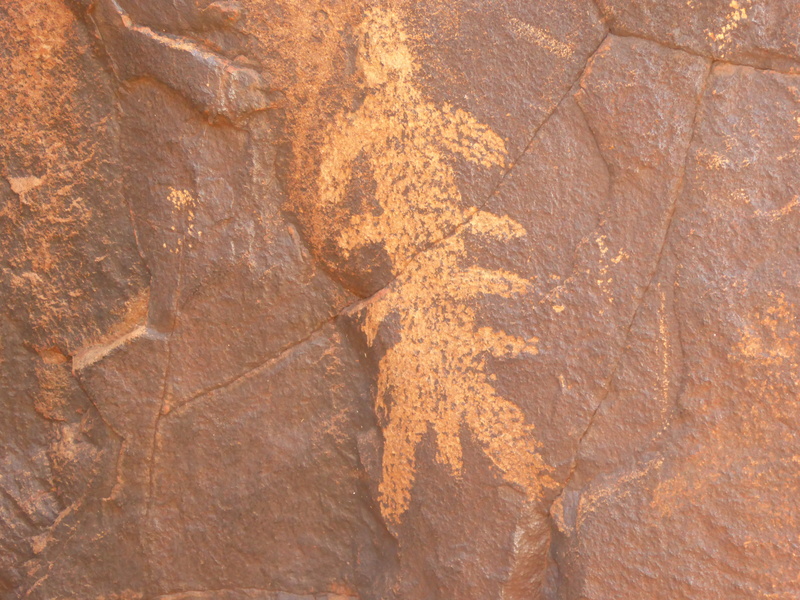 There are numerous interpretive panels educating tourists about the historic use, the sacred nature, and the significance of this site to the aboriginal people. The remains of a sheltered kitchen for women, a permanent water hole to sustain life, a men’s/boys shelter as a base years of initiation and learning to achieve manhood, and more than half the track that veers maybe a km away from the base which is still regarded as “sacred” suggest that tourists have been accommodated rather than welcomed. 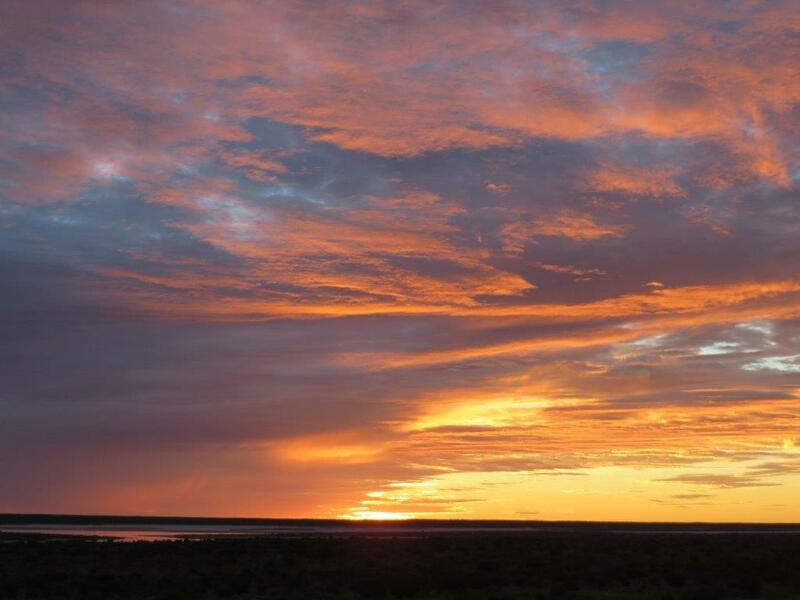 We left Yulara CP after a magnificent sunrise, and drove the 50km down past the Olgas to the start of the 1100km Great Central Road to Laverton in WA……another rite of passage for 4WD’ers. 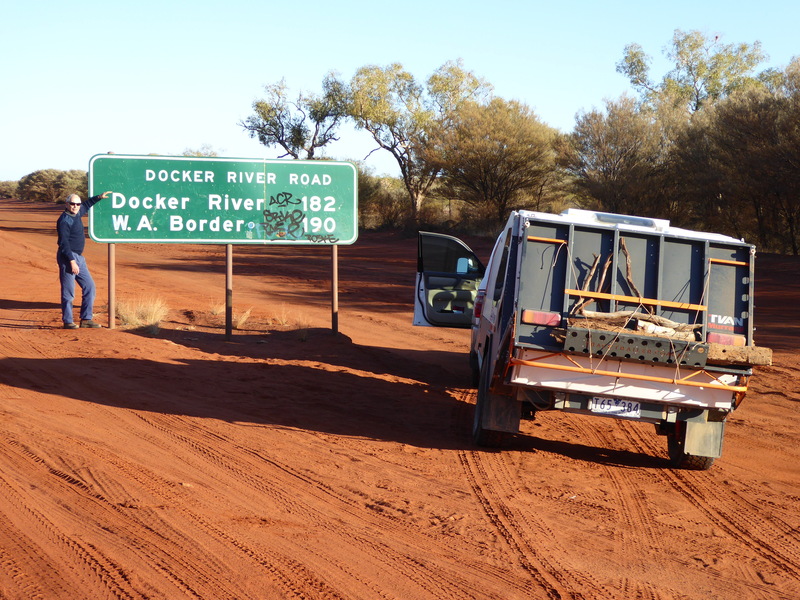 You really have little idea of what’s in front of you, but we knew the first 200km to Docker River on the NT side would be rough…..and it was. We veered back and forth across the heavily corrugated track, avoiding the odd camel, and enjoyed the journey and the ever-changing scenery. 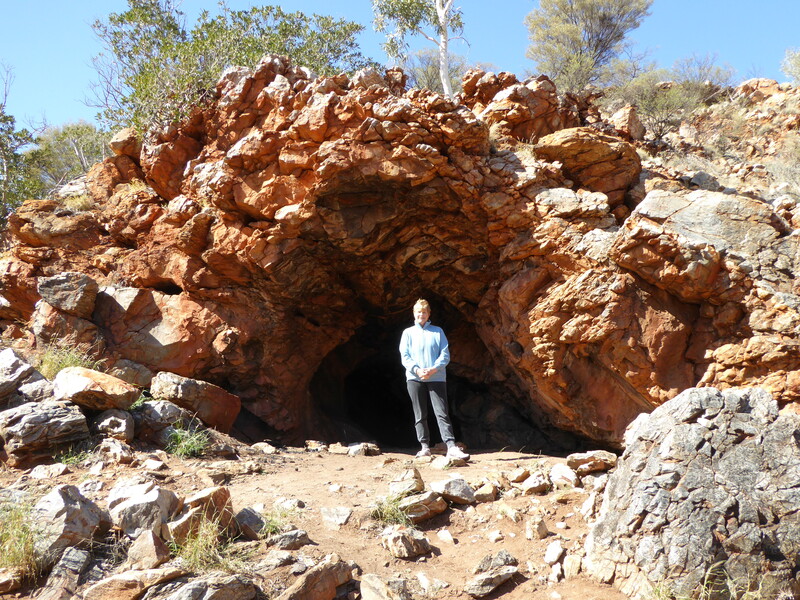 We pulled off just short of Docker River to explore Lasseters Cave. 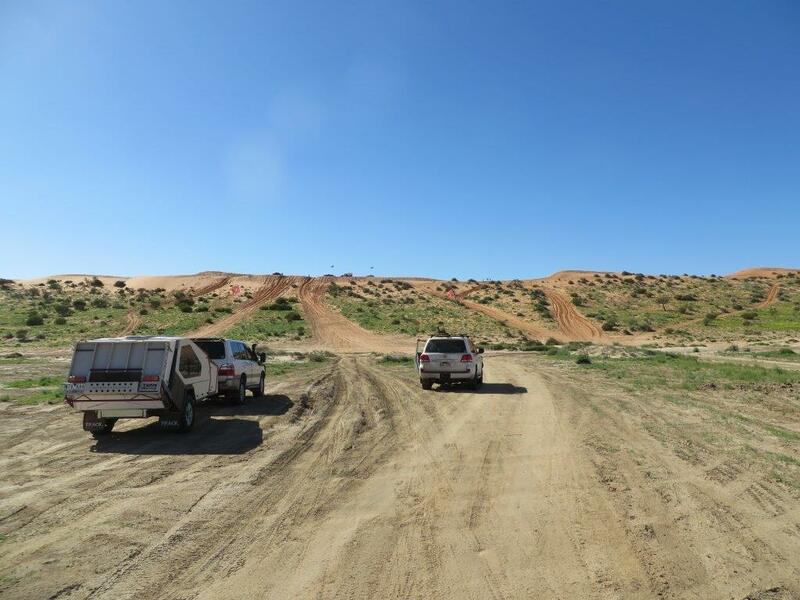 Harold Lasseter supposedly discovered a rich vein of gold in this area in 1930….the legendary “Lasseter’s Reef”, but his camels bolted with all his gear and supplies, so he was unable to plot the find. He sheltered here with little food or water, but the story goes that sympathetic aboriginal people helped him attempt to walk out 140km to a relief party, but he only made it 55km before dying. Wandering camel one of the few obstacles we passed on the crossing. Once over the border to WA, the track improved dramatically, and it was graded dirt road, so we made it to Warburton CP for our first stop aided by the hour and a half time gain. We still had time to stop at several of the interpretive signs to soak up more of the history and geography of the track. Kurrajong trees are ideally suited to the harsh climate and were real friends to the aborigines providing shelter, food, and fibre from the inner bark for nets to catch fish and birds. 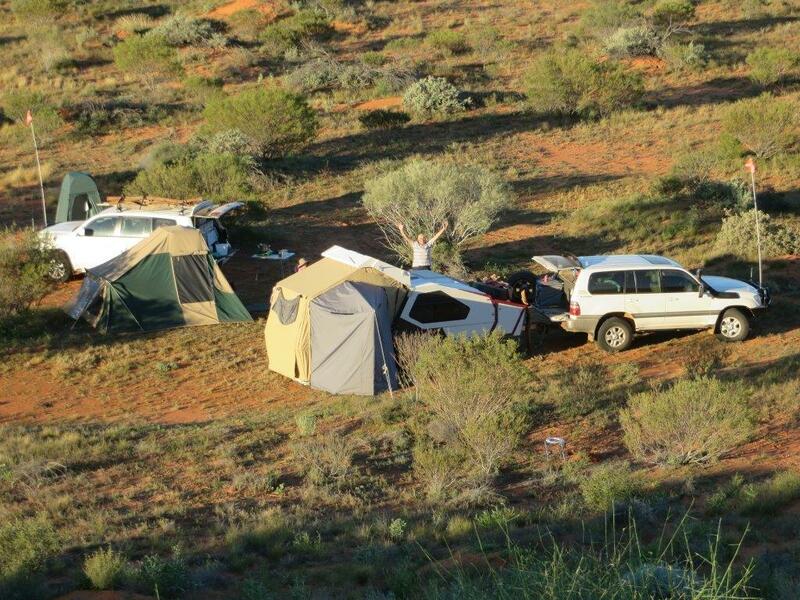 The weather forecast was for rain the following day, so we left early and decided to make it to Laverton that day. The road was really good for the most part, so we still had time to sneak into several spots off the road for a peek and a rest. 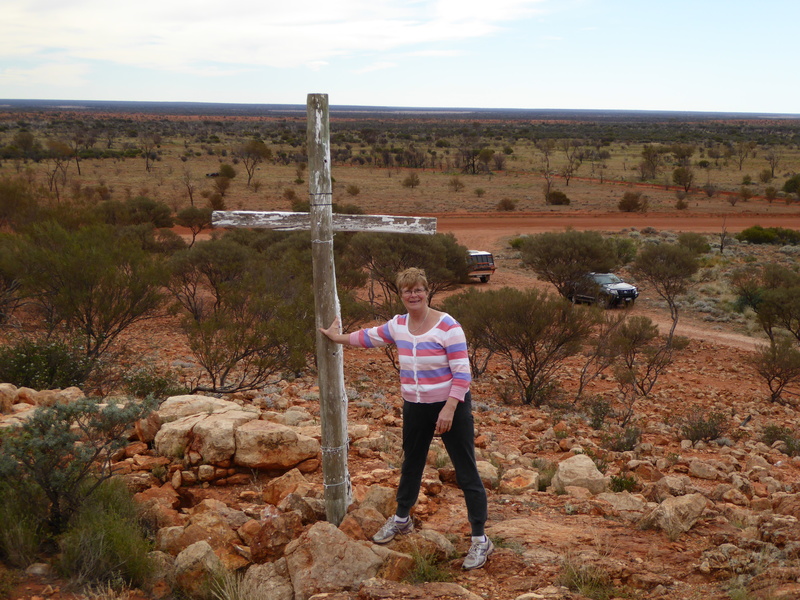 One was at White Cross, in the midst of a stand of Mulga’s, where a cross made from Mulga was erected by aboriginal Christians in 1991 to remind travellers of their belief in the importance of spiritual as well as physical health. 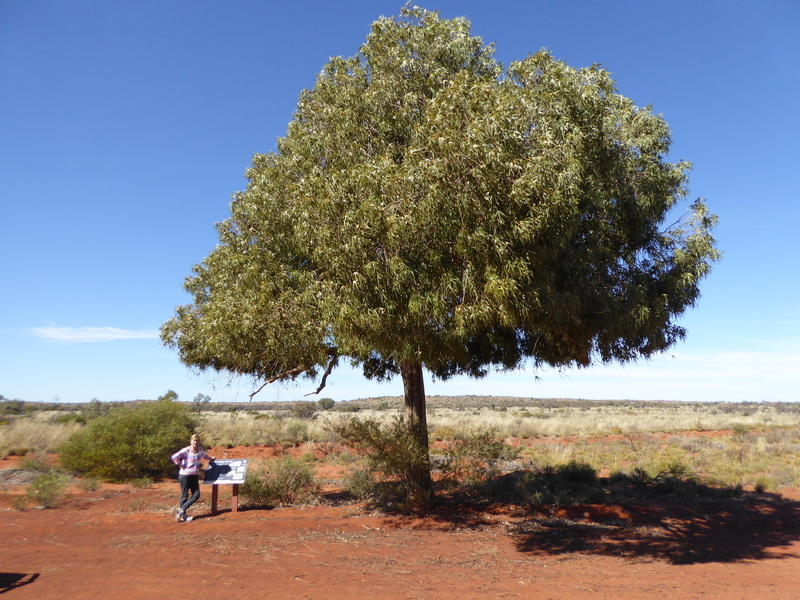 The mulga was another very important tree to aboriginals for flour from the pods, sap mixed with water to drink, honey stored by ants from the blossom, and utensils from the hard wood. 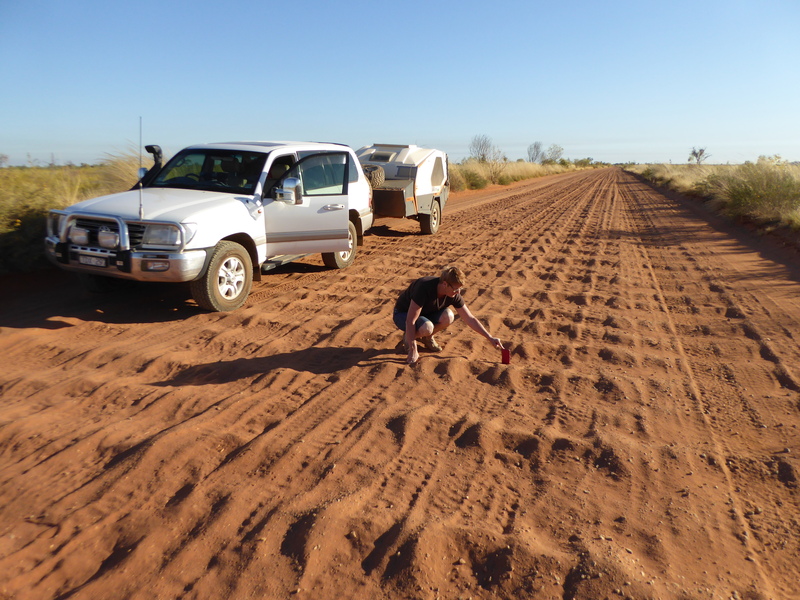 We even stopped at the Pines camp some 120km short of Laverton to remember the spot we got to on a previous crossing attempt from Laverton, before abandoning the journey due the very very rough road. We arrived at the CP late and had a snoop around Laverton in the morning, as we had no time on our previous visit. We particularly wanted to personally thank the girls at the “I” for their help on numerous occasions over several years. 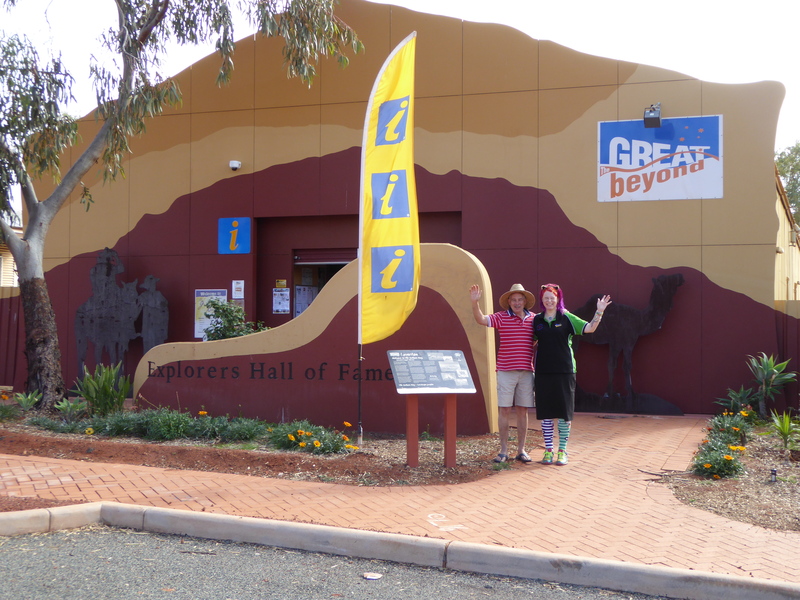 We also wanted to visit the Explorers Hall of Fame at the “I”, which brings to life some of the characters of the past as they tell their stories of hardship, bravery and perseverance in the harsh and dangerous conditions that were endured by men and women in the early days of the Goldfields. From the gold rush years to the nickel boom of 1969; from early pastoral history to local flora and fauna, this fascinating overview of the region is now available to all. Karen and Bas at the Laverton “I”…….a snappy dresser to go with her great personality. 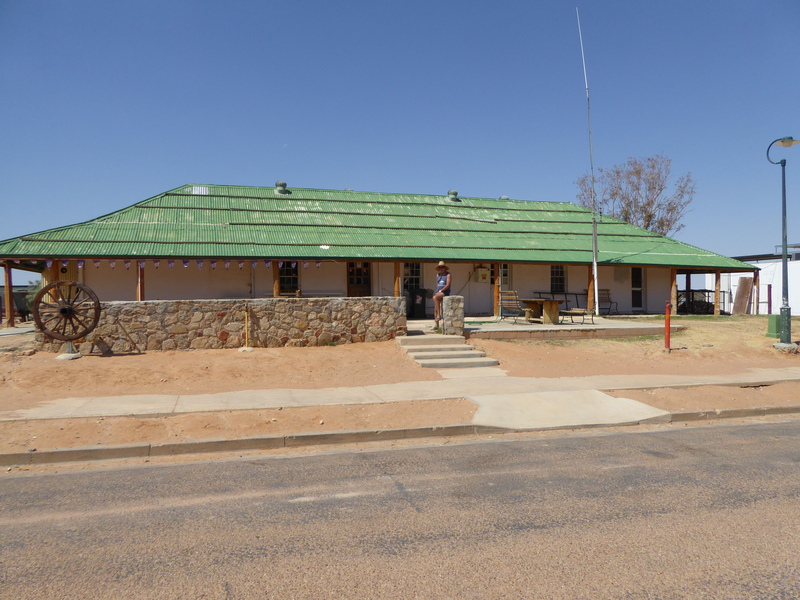 Then we headed west to Leonora, where we had stayed previously, so we did a good shop and picked up some “hydration” as well, before heading north for Sandstone in the heart of the gold country. We had also stayed at Sandstone previously, but it is a really cute place with equally cute council owned CP run “properly” by caretaker Carolyn – also cute despite her years. There is little grass in Sandstone, and very few flowers, but the CP has a little of both thanks to Carolyn. And at $10 per night unpowered with immaculate amenities (thanks to Carolyn) the park is always near full! 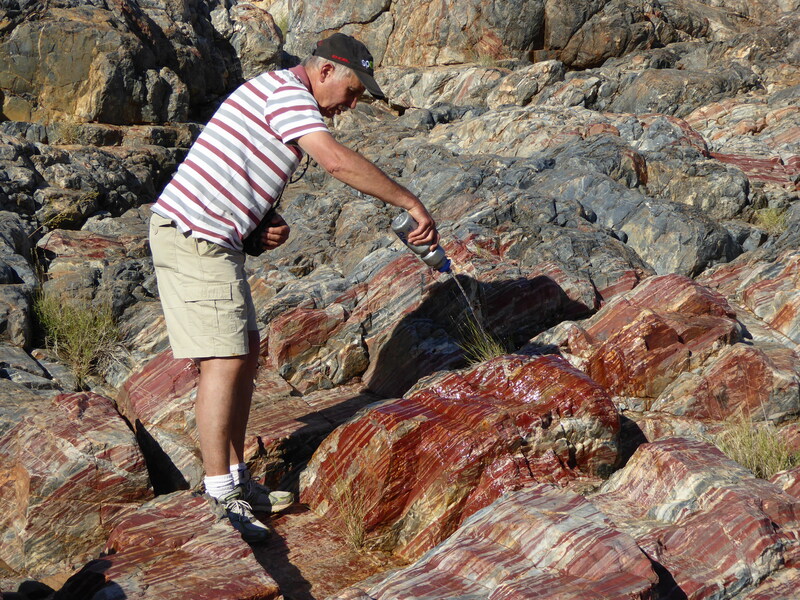 Sandstone attracts lots of serious and not so serious gold prospectors for 8 months of the year (far too hot in Summer). 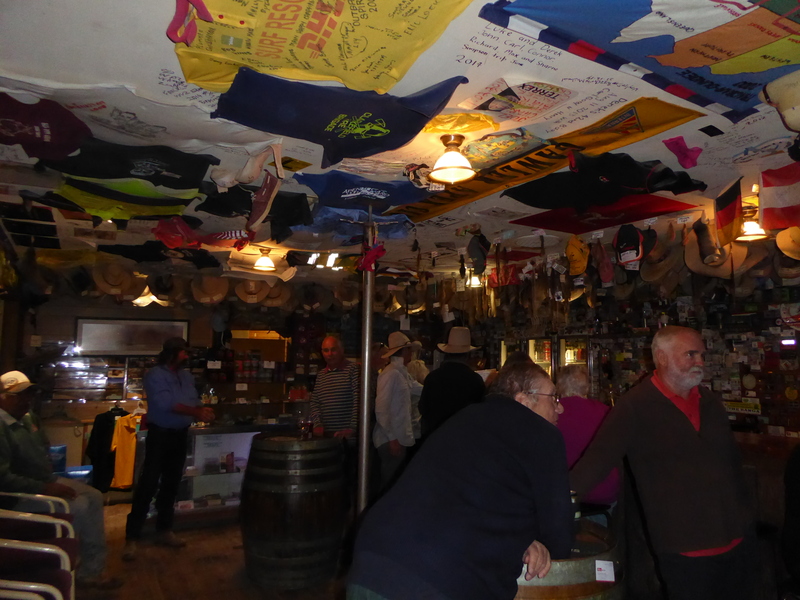 It has one pub, small Council Chambers with district museum attached, and one “I”…..no groceries etc apart from a 10 sq. m room at the pub with the basics. There are no banking facilities or ATM, so all transactions are by card unless you have exact (or nearly) change. But when we arrived this time the place was crawling with police, and detectives from the major crime squad……there was a nationally broadcast missing persons alert in March: a missing lady whose husband was found dead down a derelict mine shaft 30km out of town in prospecting country…..and it was still unsolved. So we were not entirely surprised when approached by a tall young detective and his very pleasing to the eye female detective partner when we stepped out of the Cruiser in town. 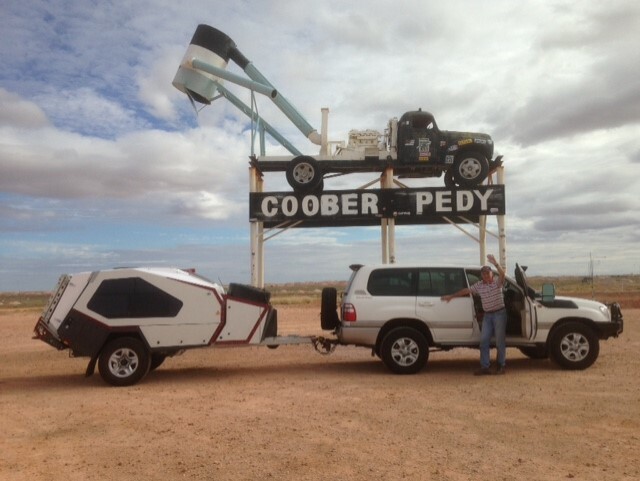 But he was only interested in the Tvan as he was planning outback travel for the future! Sorry, there are two other enterprises in town: a Chinese guy who bakes bread, grows veges and cooks at the CP one night a week, and part-time at the pub I think. Denni needed a trim, so went to the haircutters home and got “short back and sides”…and top for no extra…only cash here, and around $20 is enough…no extra for the goss! We needed a break, so stayed 2 nights in one of our “soul” places. 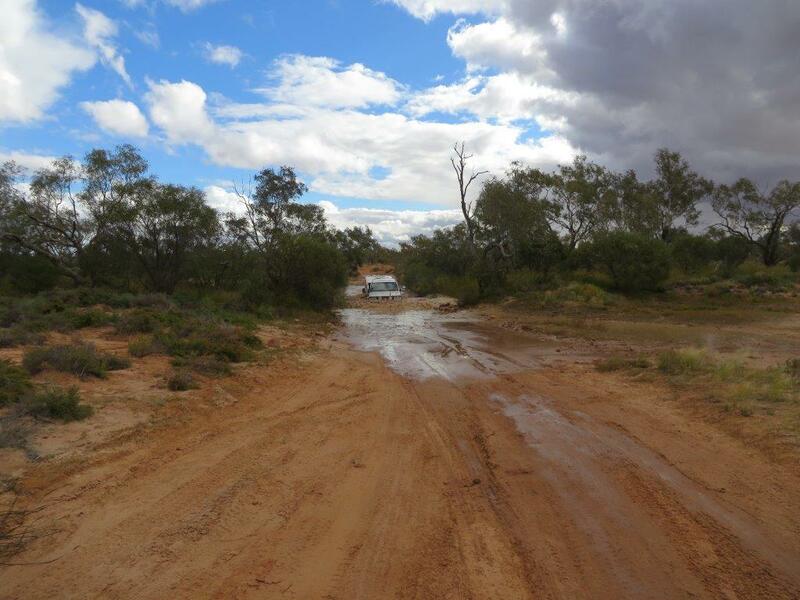 Unfortunately it rained most of the night, so our cross-country track to Meekatharra was closed when we left. The alternative was to follow the bitumen to Mt. Magnet then up to Meekatharra, all places we have been to and enjoyed previously, but necessary to get to the Great Northern Hwy which leads north to Newman, another place we hear about, so have to visit. 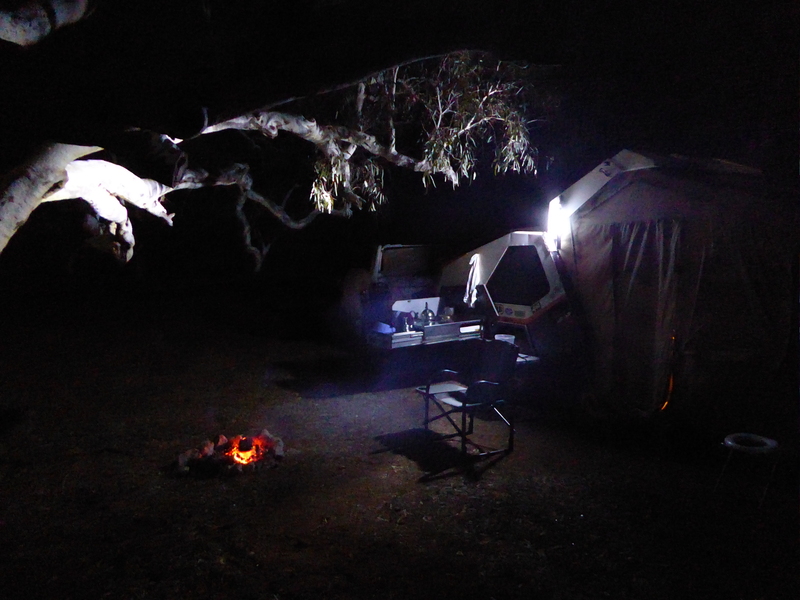 We were tipped off about a great free camp off the Hwy by people we met way back at Warburton on the Great Central, so gave it a go, even though it was some 15km off the Hwy…and we are glad we did. We arrived at Newman around lunch-time the following day, took a non-power site at the CP for 3 days, and went exploring. Iron ore was first discovered by Sam Hilditch in 1957 and mining commenced in 1967 after a Comm. Govt. embargo was lifted. He is well remembered with a steel statue of him and his wife overlooking the town. 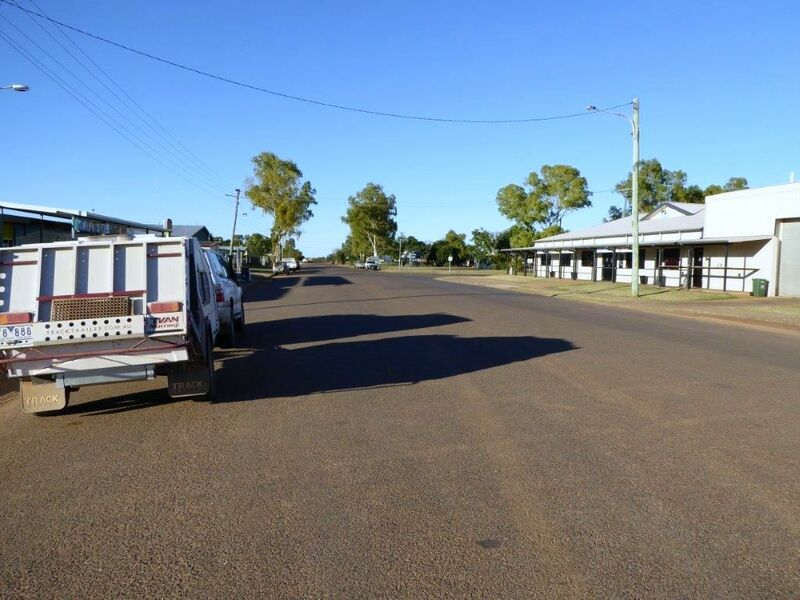 Newman is now quite a sizeable mining town, popln around 12,000, with Woolies supermarket indicating that. 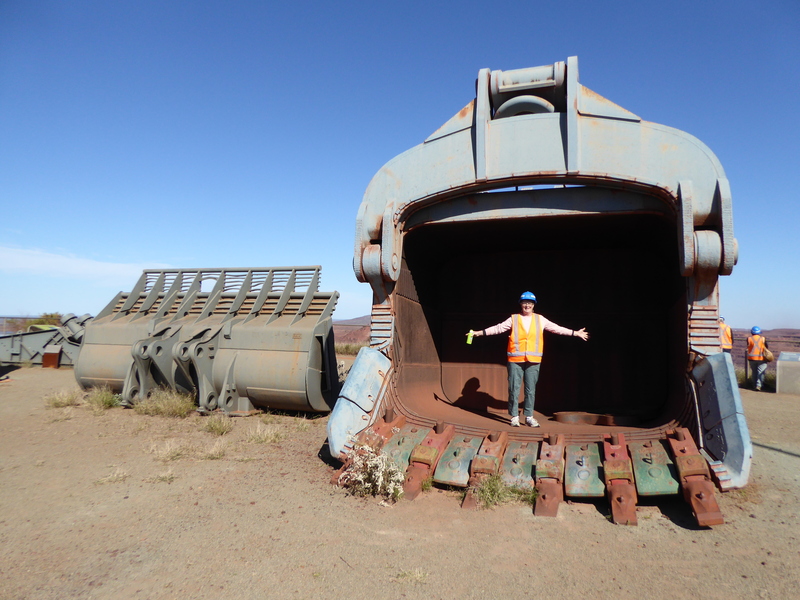 It is purpose built for the “world’s largest open cut mine”, Mt Whaleback iron ore mine. It has modern amenities, extensive sporting and recreational facilities, a busy airport, an exceptional “I” with very helpful staff, and expanding residential housing estates. 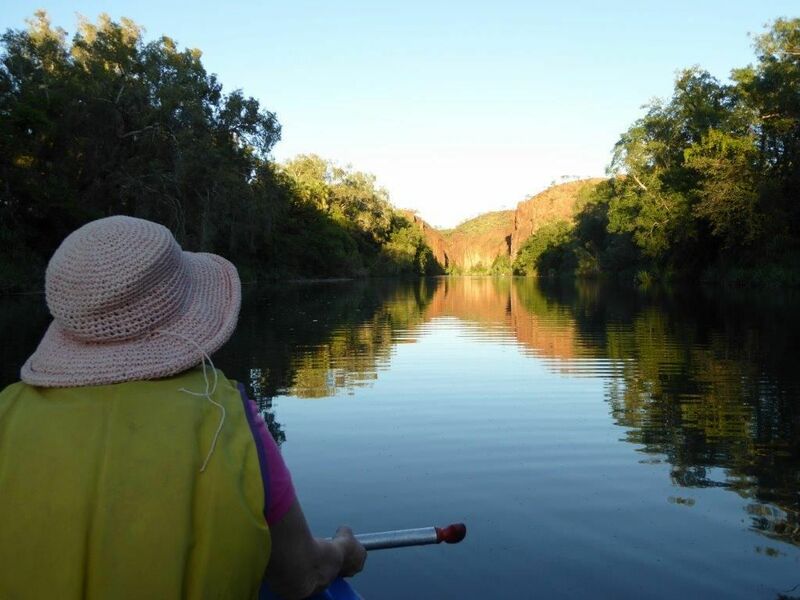 There is also a trail of highlights to follow which includes aboriginal rock art & painting, gorges and watercourses, and the recreational lake which doubles as the town’s water supply. But the highlight is the mine tour. The statistics are endless, but one that sticks is the railway to Port Headland, the longest privately run in the Southern Hemisphere (426km). Forget the more than 1 billion tonnes of iron ore shipped out so far in the 300,000+ tonne ships, I like the 248 carriages (each carrying 135 tonnes of ore) on each of 7 trains, 2.6km long making the 8 hour journey every day! Mt. 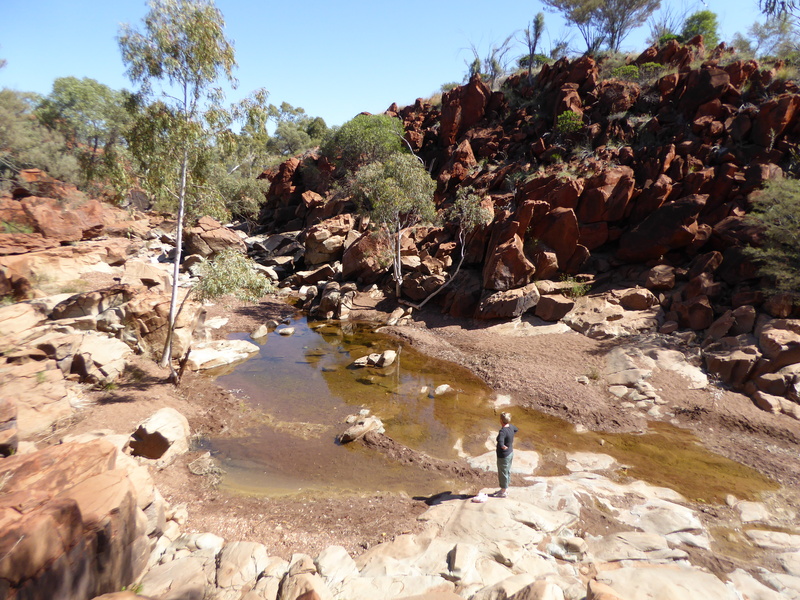 Whaleback was originally 805m above sea level and is currently mined down to 135m, well below the water table, so they need to pump out 46million litres of water each week to keep it dry for mining!!! And guess what, the whole operation is operated by remote control from Perth!!!! Trust me, this operation has the ultimate WOW factor. Close-up of the current mining loading a 200 tonne ore truck…..when fully loaded weighs more than the take-off weight of a 747 jumbo jet!!! From Newman we went out back again on the Marble Bar Road 300km to Marble Bar, Australia’s hottest town. And you don’t escape the mining trucks either, on bitumen and dirt. I’m quite happy to give them all the road. You have rite of way sir, especially as I can’t see beyond you!!!! 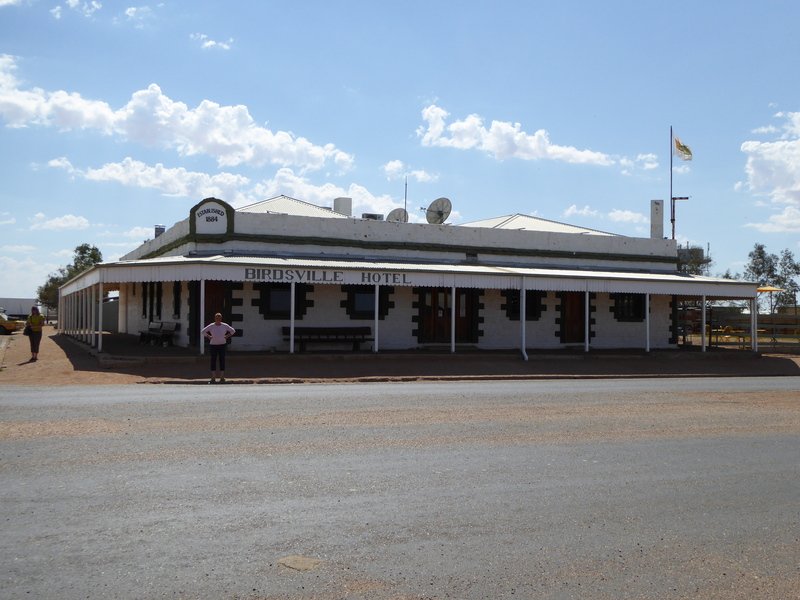 It is a small cutie of a place in the largest Shire in the world, with a roadhouse/ grocery store, elegant Council Chambers/ “I”, and of course a swinging outback pub, school, swimming pool, community resource centre, and quaint CP where we were pleased to camp under shade with OK amenities. 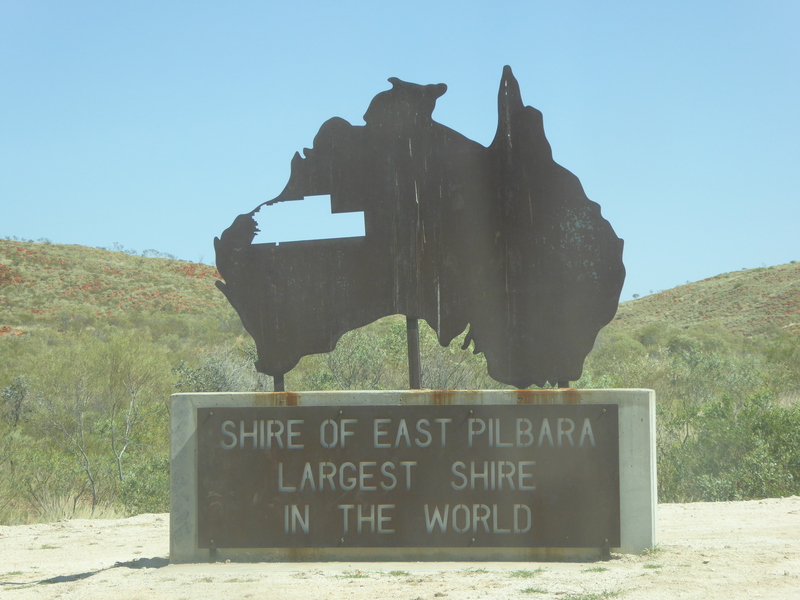 It has a great town entrance with steel architecture, and two great lookouts over the town and surrounds, but as you would expect the highlight is the “Marble Bar” which is best left to the pics to describe. We then travelled another 170km east into the never-never to Carawine Gorge. 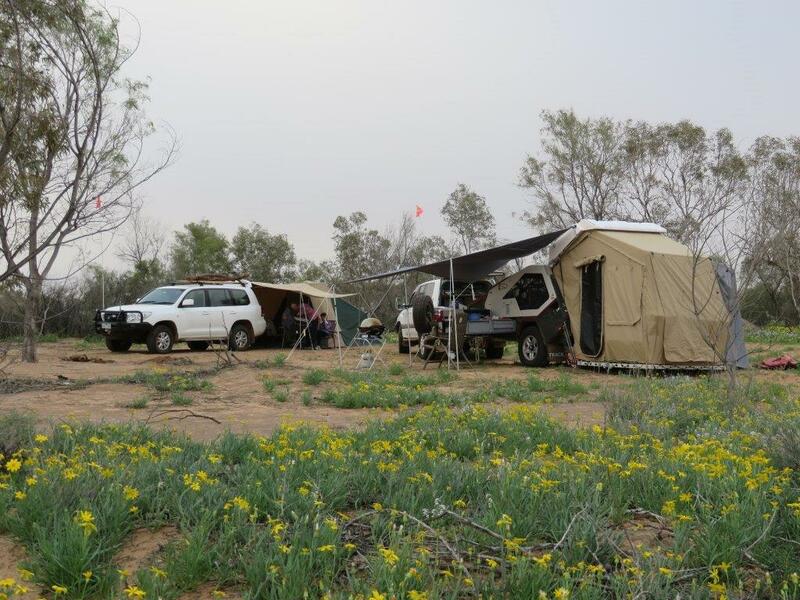 It is a free camp on a working cattle station I had seen in previous reading about the area and just wanted to have a look…..as you do. It didn’t disappoint, being right on a permanent waterhole with the gorge face across the water. 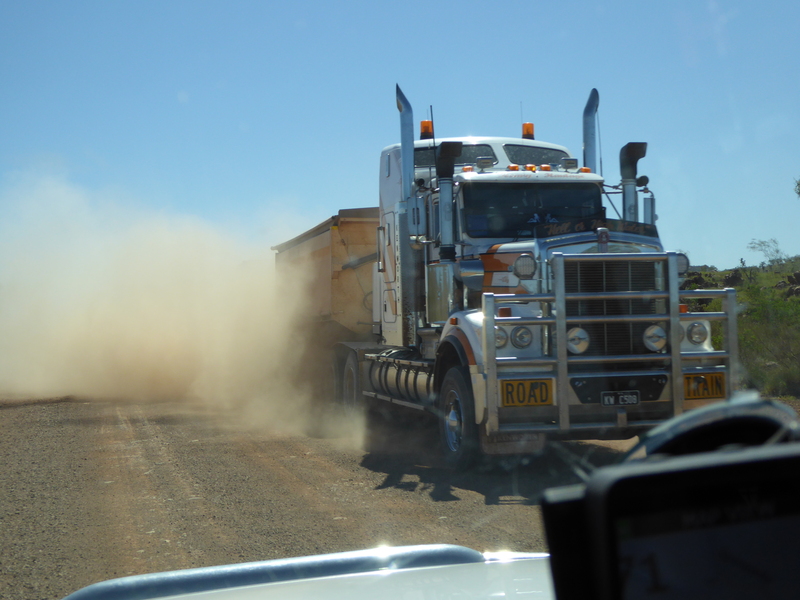 Then 170km back to Marble Bar passing many 4-trailer mining trucks carrying gold/copper ore from the Telfer mine, a totally fly-in fly-out operation 400km from Port Headland. We didn’t stop as the coast was calling, so another “shortcut” on reasonable dirt road amongst numerous aboriginal settlements had us at our destination of Cape Keraudran early afternoon. The park ranger was really helpful and guided us to one of the smaller campgrounds right on the beach. WE did enjoy setting up right on the rail overlooking the aqua water that WA is famous for. We just relaxed for 3 days, enjoying the warm days, long beach walks, crystal clear water, and memorable sunsets. We had planned to stay a little longer, but the sand-flies eventually won!! 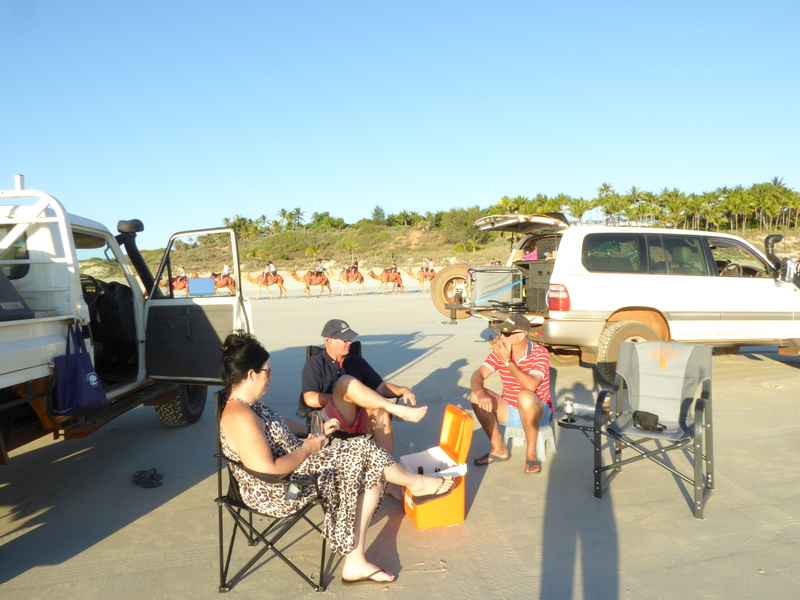 So up the coast to Broome to stay with friends from our farming days at Nangiloc. They have 2.5 acres a bit out of town on the Cable Beach side, and have created a gorgeous palm shade getaway for family and friends with vans. John’s father and partner stay 3 months a year, and we had stayed in 2011 on our first big lap, but it was so much better this time. Despite all its hype, we actually didn’t really “get” Broome on our last (flying) visit, but this time we made time to explore and appreciate the culture and soul of the town….and now we love it. 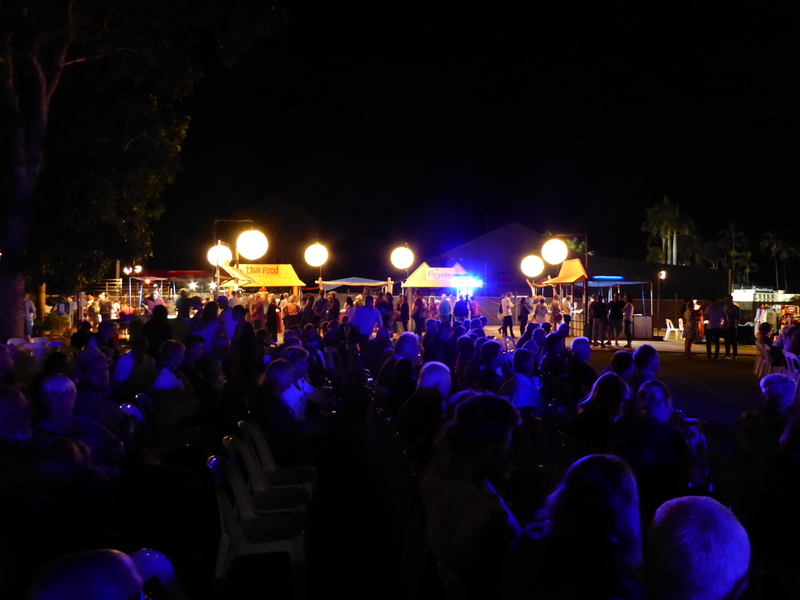 The defining moment came when we went to the “Taste of Broome” outdoor Music Picture Show”. 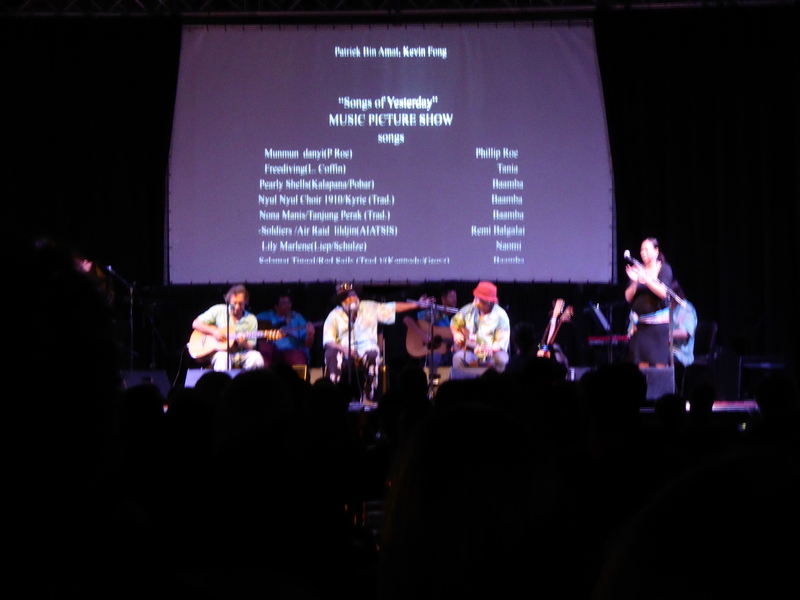 After a welcome to land from an elder, some traditional music and dance, we were privileged to experience slide show backdrop of photos of Broome’s cultural history with a musical/ storytelling extravaganza from Elder, Stephen, and Naomi Pigrim…….we bought 3 CD’s as well. Now we understand Broome’s history, the reason for so many nationalities living in harmony punctuated by pearling and WW2 bombing. Long blurry shot of one guitarist, then Elder, Stephen, and Naomi Pigrim with the large screen as a backdrop. 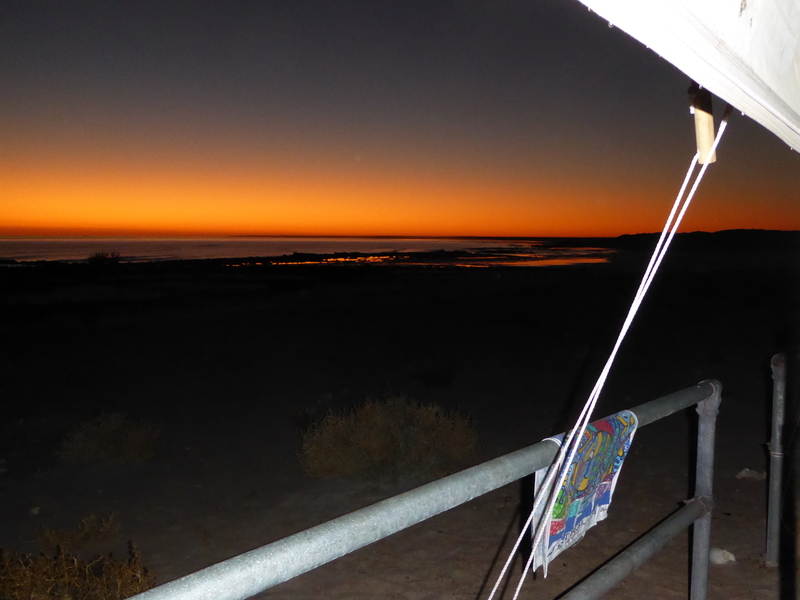 We had a sausage sizzle with John & Vanessa on Cable Beach to watch another sunset, and were treated to a fresh seafood feast by Brian & Jen at camp. But we are only half way on our journey, so stay tuned for the last episode.